We have been busy bees recently. 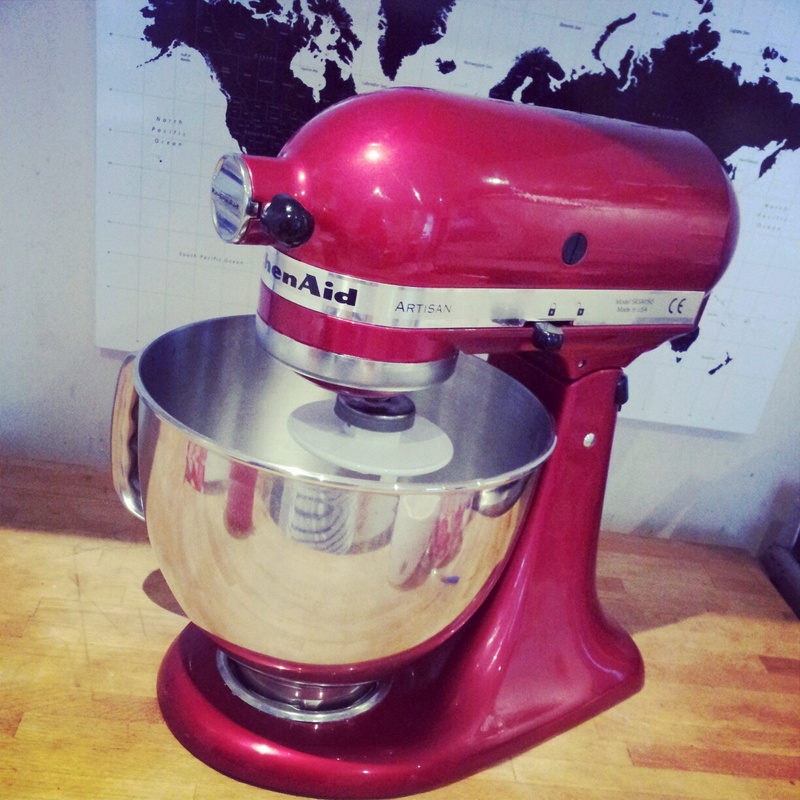 I put some of our wedding present vouchers to very good use and invested in a beautiful Candy Apple Kitchenaid Mixer. 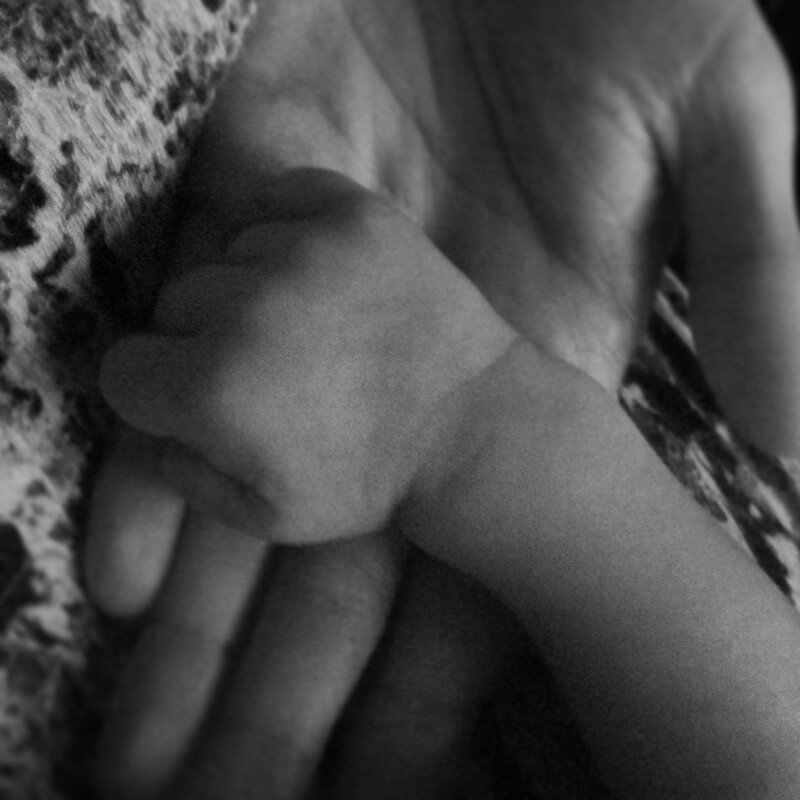 I have christened her Joni and she has already proven her weight in gold. My 30th birthday was approaching fast and wanting to mark the occasion my friend Jill (who’s birthday just so happens to be the day before mine!) and I decided to have a little soiree at our local pub. Cupcakes seemed to be a good option for a gathering, so we didn’t have to worry about plates, knives and such like. It also meant that we could go a bit mad with the flavour combinations too. On my actual birthday! 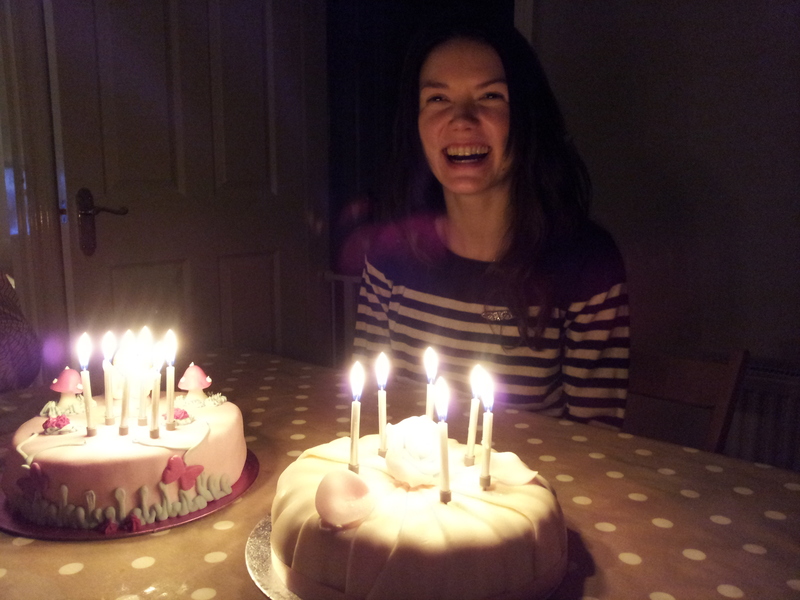 What a lucky birthday girl I am with 2 surprise birthday cakes from my mam and my sister. We’re not going to go hungry. EVER. 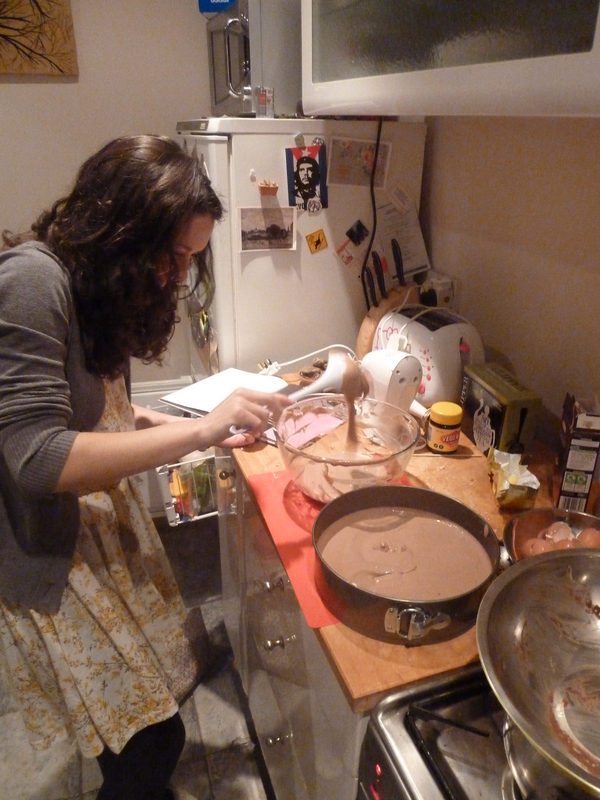 The week before our birthdays, Jill and I spent a merry evening baking everything in sight. 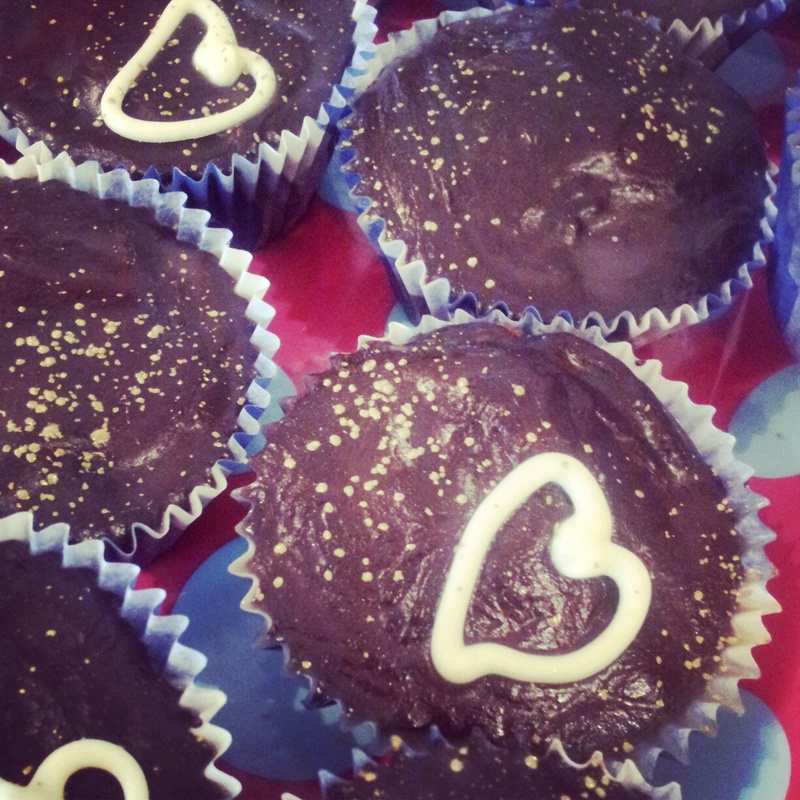 Modifying Hummingbird Bakery recipes to our hearts content. 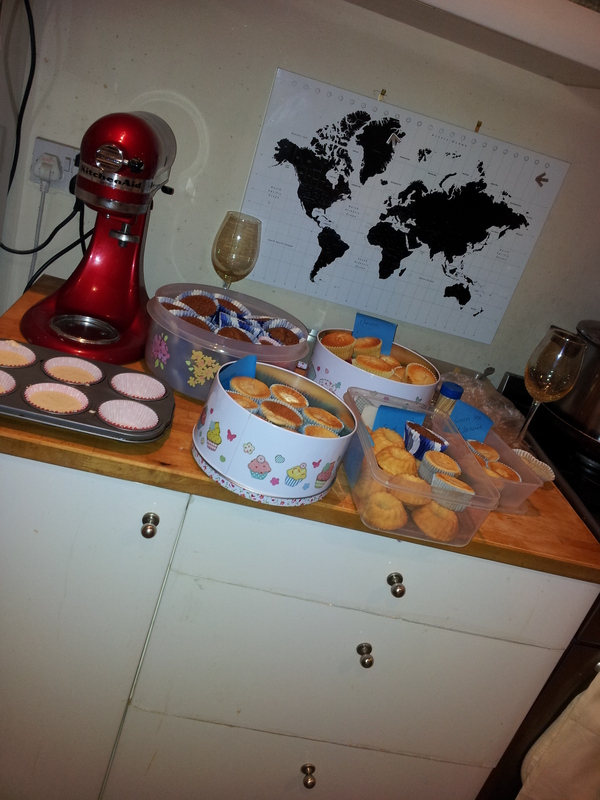 It’s amazing what can be achieved in 3 hours by two 29 year old girls, armed with a Kitchenaid and a bottle of prosecco. We got very creative indeed. 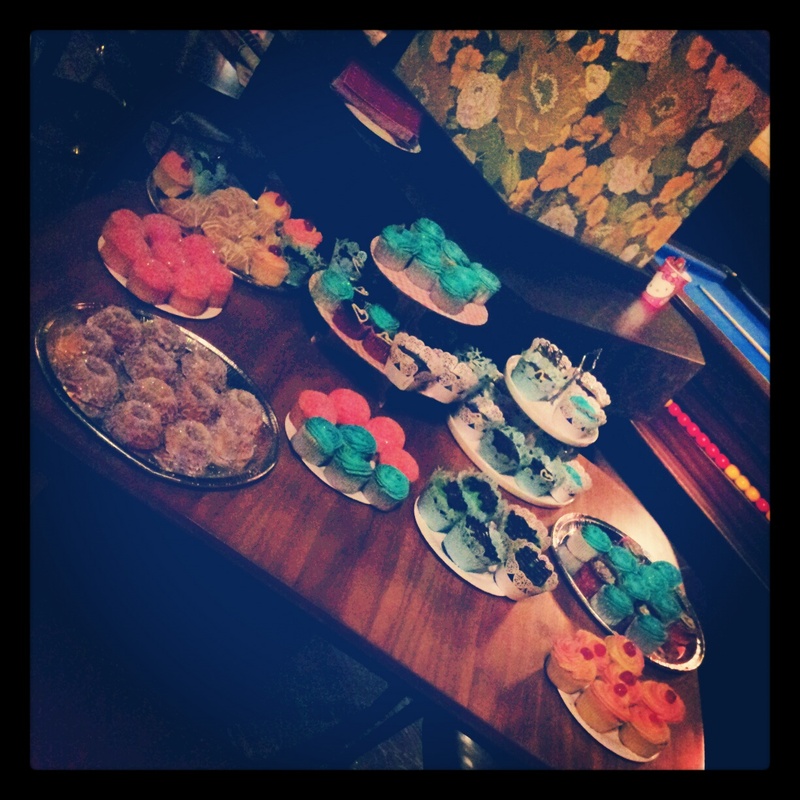 We baked well over 100 cakes and still made it to the pub afterwards to meet our husbands. I must admit we sampled rather a few along the way so not all of the cakes made it into our freezers to await their icing. 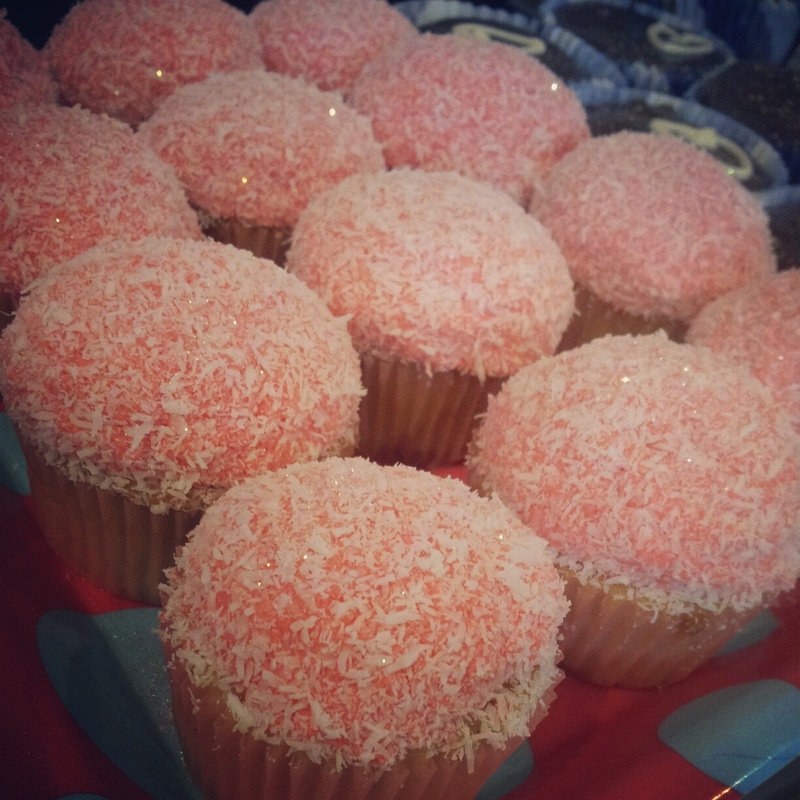 It’s hard to resist when you’ve got cupcakes hot out of the oven dancing in front of your eyes. The following week we defrosted our cupcakes and spent an entire day icing the lot, with lashings of buttercream, glitter and ganache. The results were very well received by our friends and the bar staff! The Jasmine green tea cupcakes were a surprise success after I accidentally emptied the entire bottle of Jasmine Extract into the cupcake batter… They are the most fragrant cupcakes I’ve ever created. Perhaps an acquired taste for some and definitely an excellent air freshener accessory. Happy birthday to us! What a wonderful start to the new decade! Naked cupcakes freeze really well and can keep for a month. Freeze them as soon as they’re cooled in freezer bags/Tupperware and this holds all of the moisture in sponge. Leaving you with a wonderfully moist cupcake when you choose to ice it later on. You normally need more buttercream than you think so again feel free to make a double batch! The more you beat buttercream the better it is. 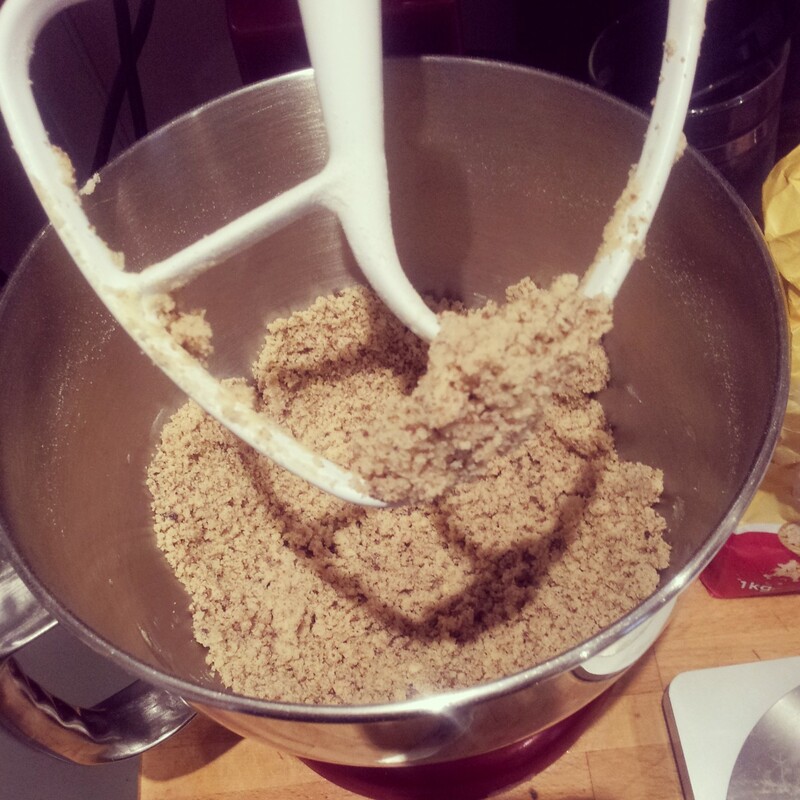 Rub together (using an electric whisk if you have one) the sugar, butter, flour salt and baking powder. When it all looks quite sandy beat in the wet ingredients including your choice of flavouring! 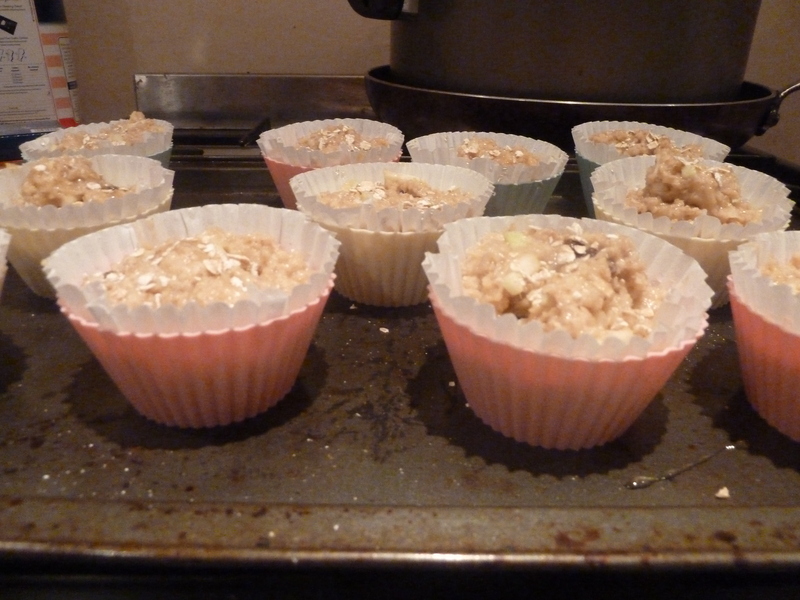 Then pour the smooth liquid batter into prepared cupcake cases in a muffin tin. Bake for 20-25 minutes in the centre of the oven at 170 degrees celsius until golden brown and springs back when pressed. To be extra certain they’re cooked insert a cocktail stick and if it comes out clean it’s definitely done. The possibilities are endless! Create your own flavour combinations!! 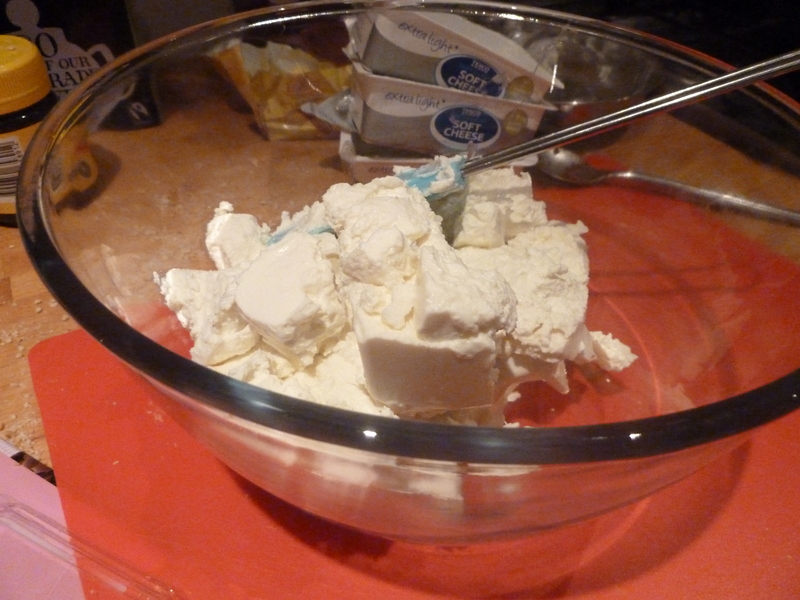 Depending on your style of icing you may want to double the quantities of buttercream. 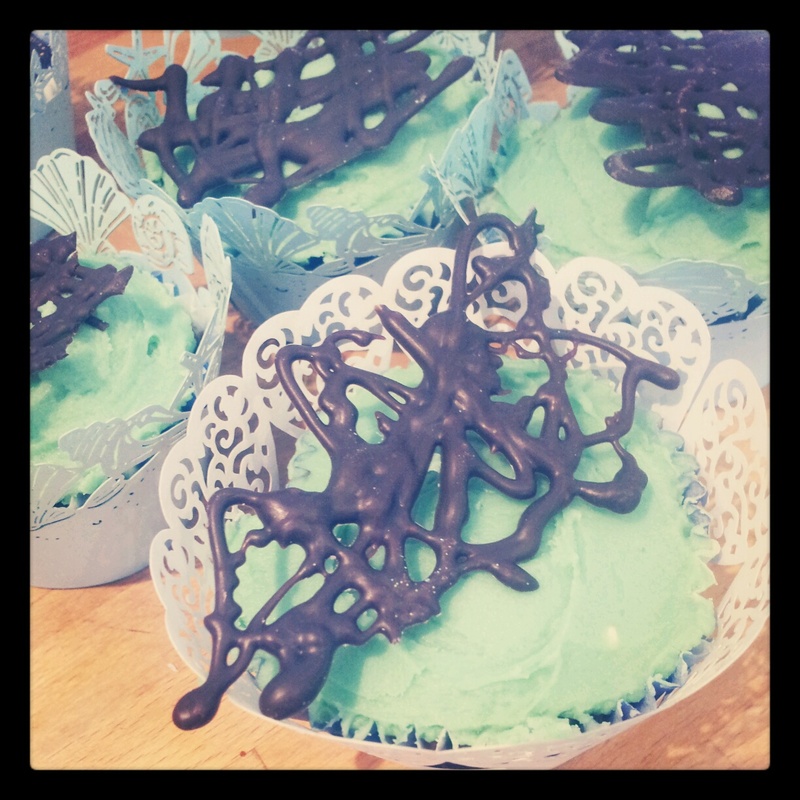 Piping swirls and roses uses a lot more icing than creating a palette knife swirl. You can see here the rules are simple. Add whatever flavour extracts you like. 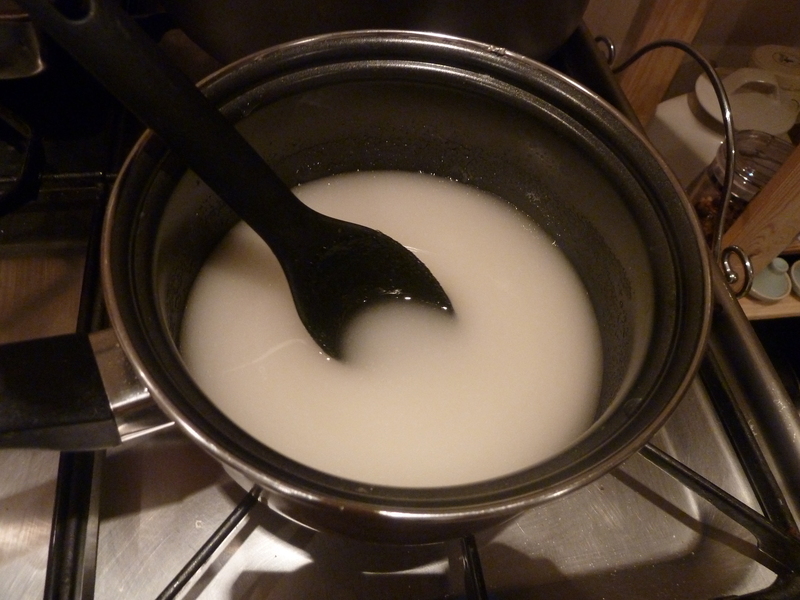 Substitute milk for liquid or boozy flavourings. Zests are good to add as they are dry so won’t effect the consistency of the buttercream. If your icing is looking a bit sloppy beat in some more icing sugar and return it to the fridge to set a bit if it’s too runny. 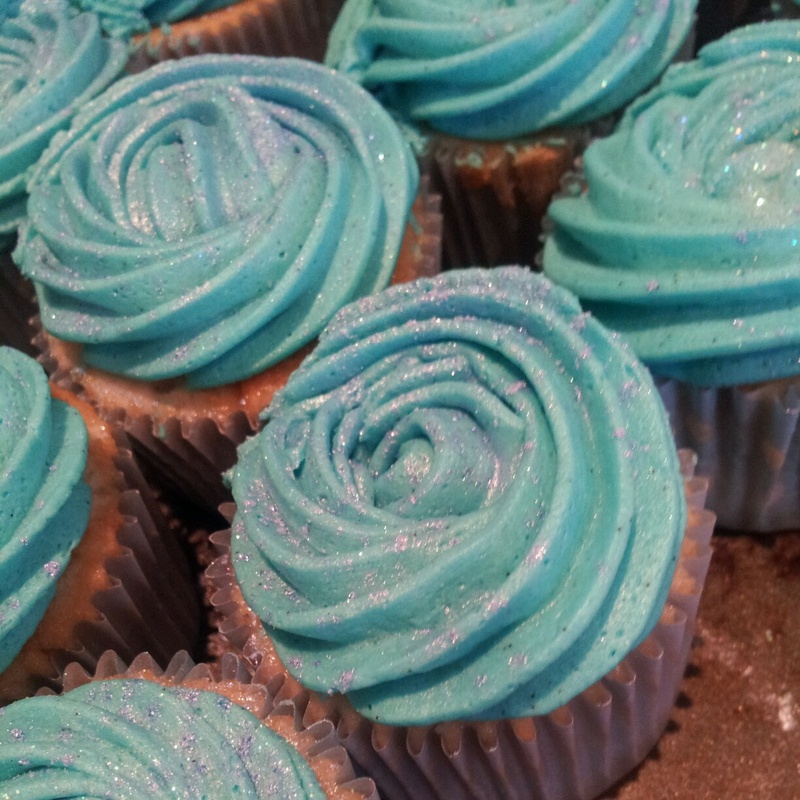 Use a piping bag and star shaped nozzle to pipe swirls, Mr Whippy peaks, stars or roses onto your cupcakes. 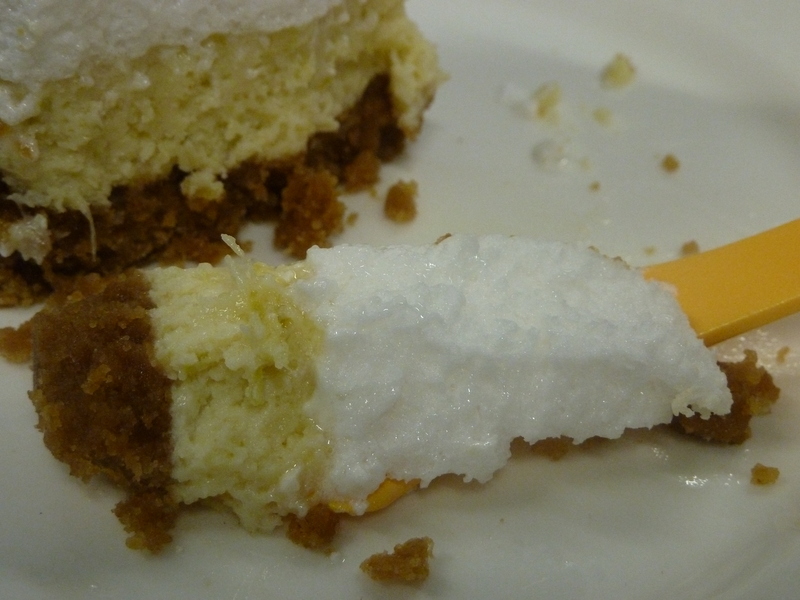 Or use a palette knife to smooth a swirl of buttercream onto your cakes. If you would like extra moist cakes you can add a syrup to the sponge whilst it’s still warm. Warm the sugar and rum in a pan over a low heat. Simmer it until it’s reduced by half in volume. Once cooled pour over your cakes. Allow it to soak in before icing your cakes. Feel free to use other flavours too! Lemon juice, rose water, cordial etc make a really good syrup! Using a cocktail stick add a couple of drops of your food colour gel of choice and beat until its fully incorporated. You can always add more if needed. 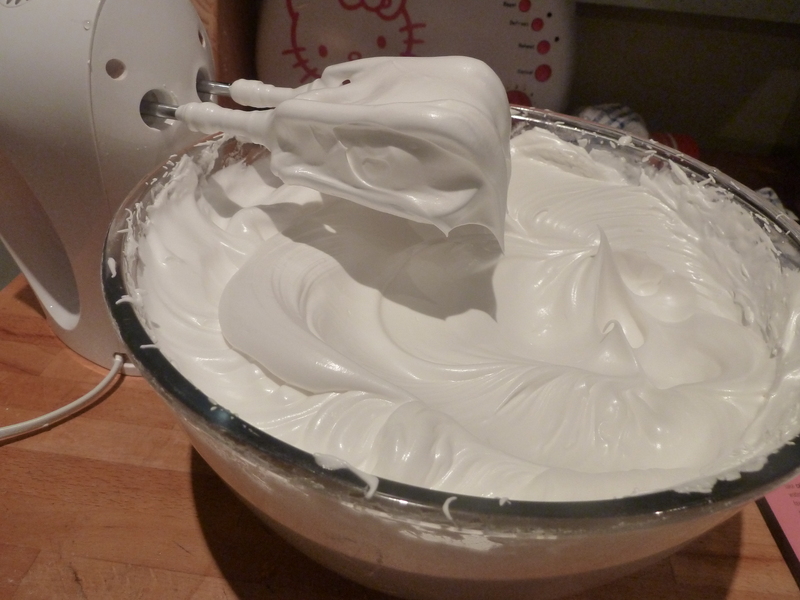 If you want to swirl 2 colours together, split your buttercream in half. Colour each half whatever you fancy. Pipe one colour buttercream down one side of a piping bag and then pipe the different colour down the other side of the bag. 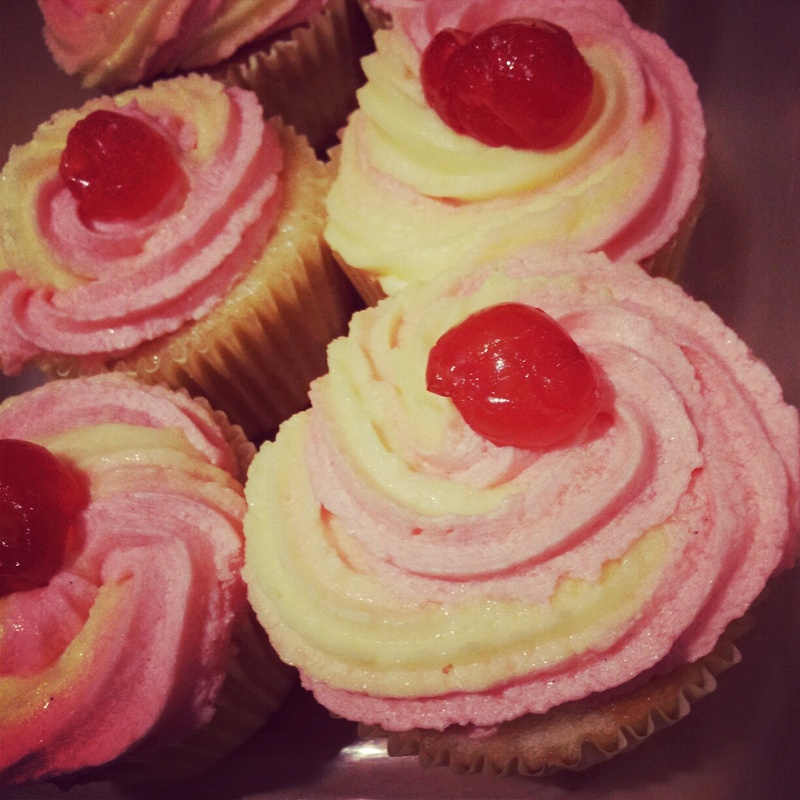 You will then get a lovely swirl of colours on you cupcakes when piping the two colours simultaneously from the same bag! You could use white chocolate if you add more white chocolate to the mix as it contains less cocoa solids so it won’t set until there’s more chocolate than cream in the mixture. A spot of late night preparation was in order to get this dough on the road. 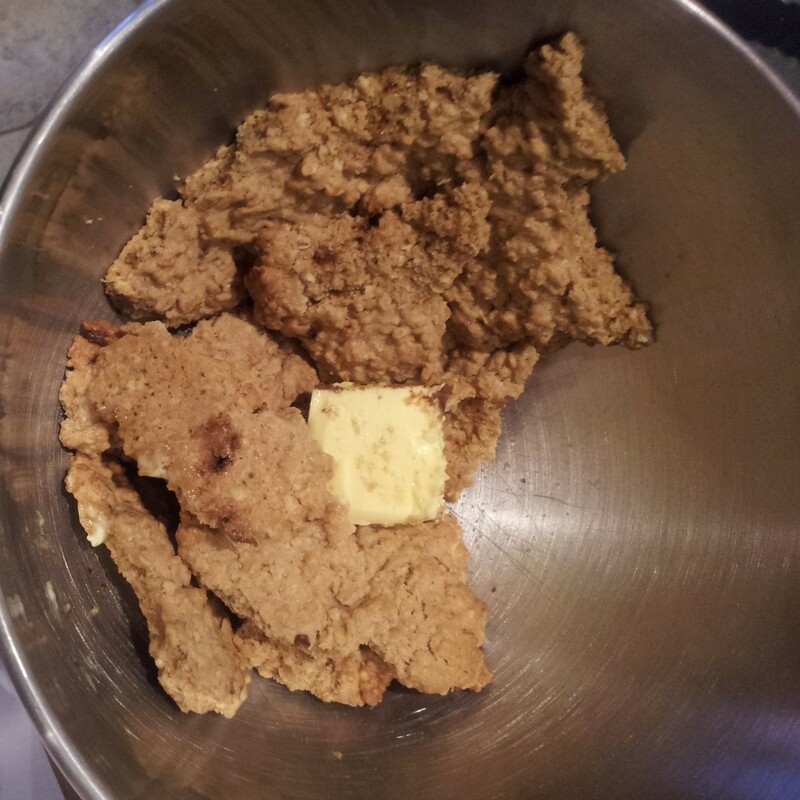 I mixed together the flour, dried yeast and a little salt to0. 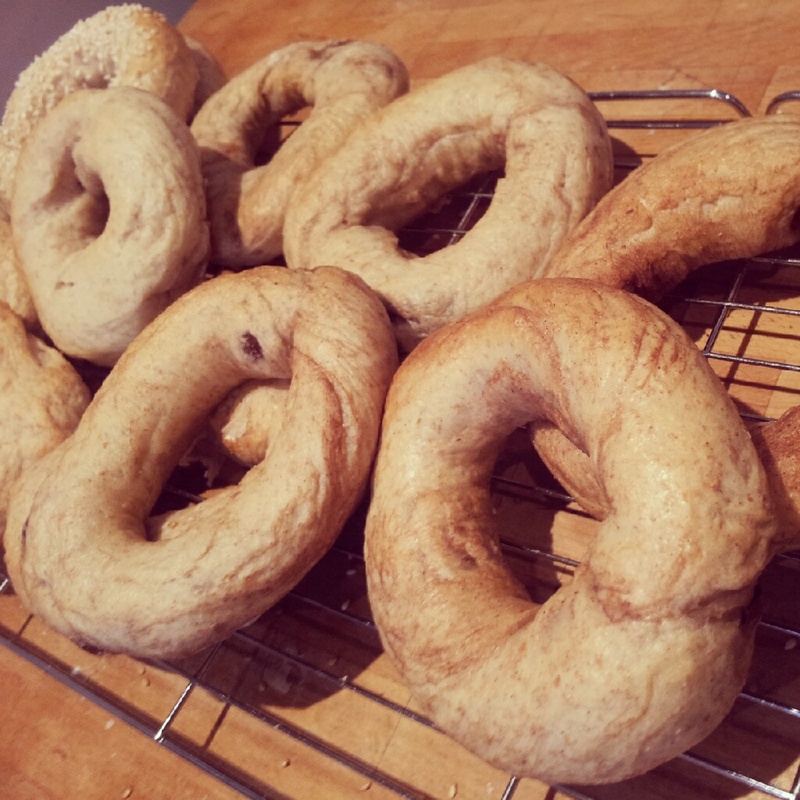 I ran out of strong white flour so made up the difference with brown strong flour, so these bagels were almost healthy too. 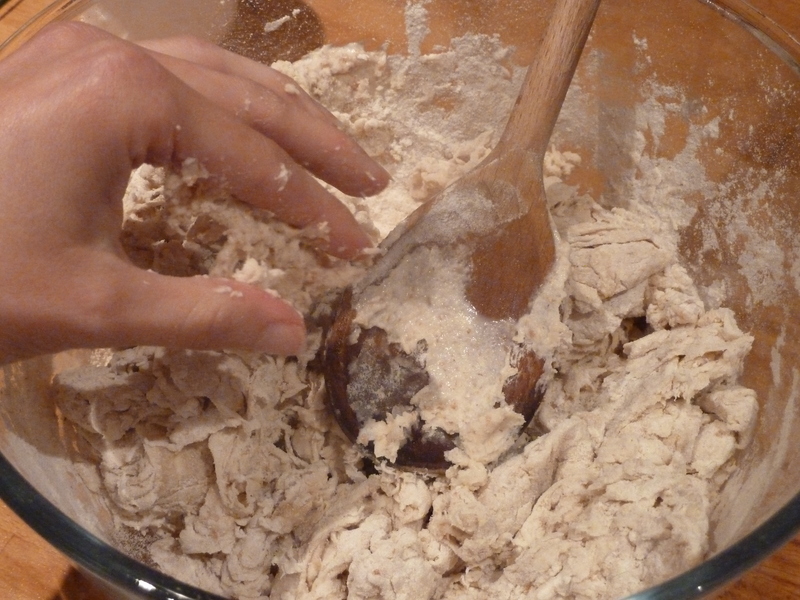 Add the water to get a sticky dough and stir! Then to add the water. 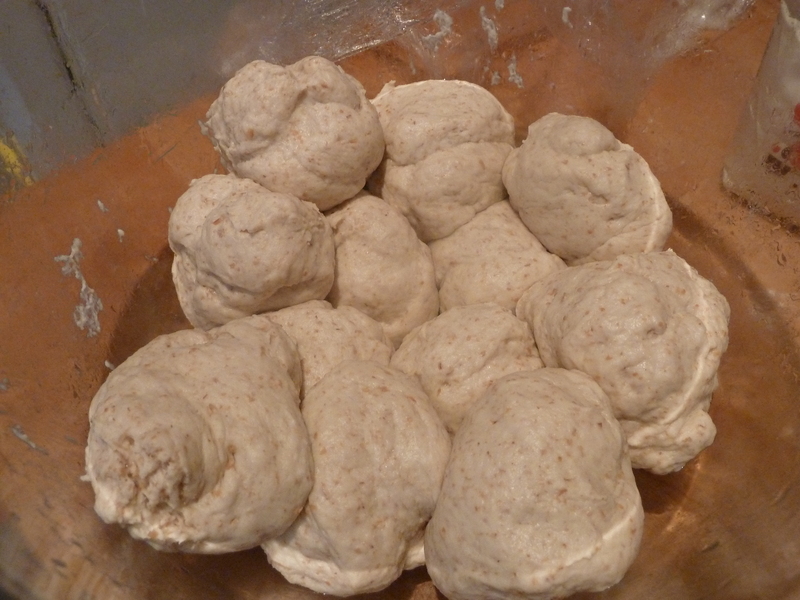 I had to add a little more water as I worked with the dough, probably due to the slightly drier brown flour I used. 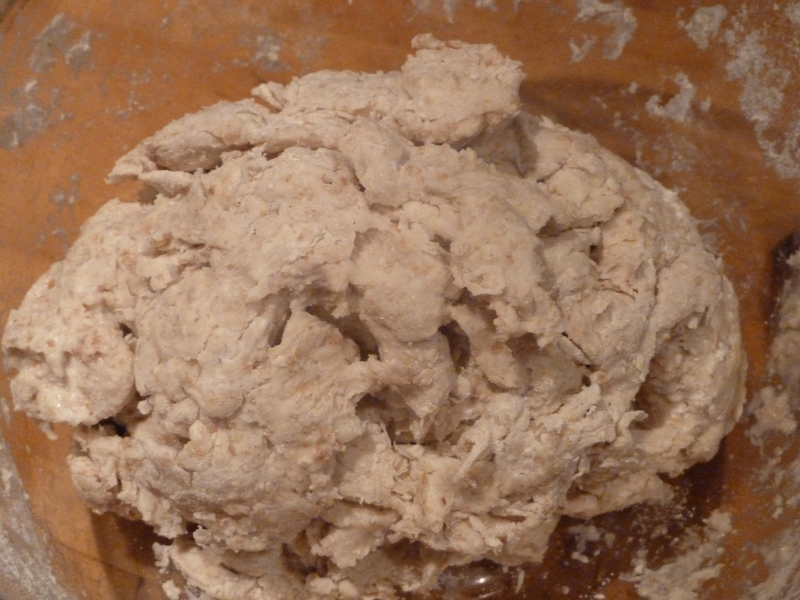 When I started kneading the dough I was determined to reach the elusive ‘window pane’ stage where the gluten in the flour has become all stringy and elastic and stretches out when pulled to create a transparent window when held up to the light in the dough. 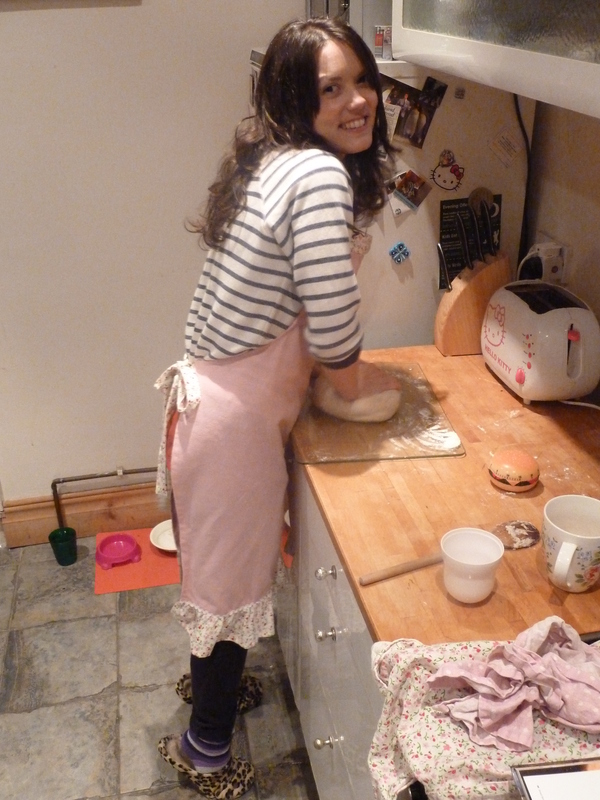 Alas after the allotted 10 minutes of kneading the rather tough dough by hand I was still windowless. 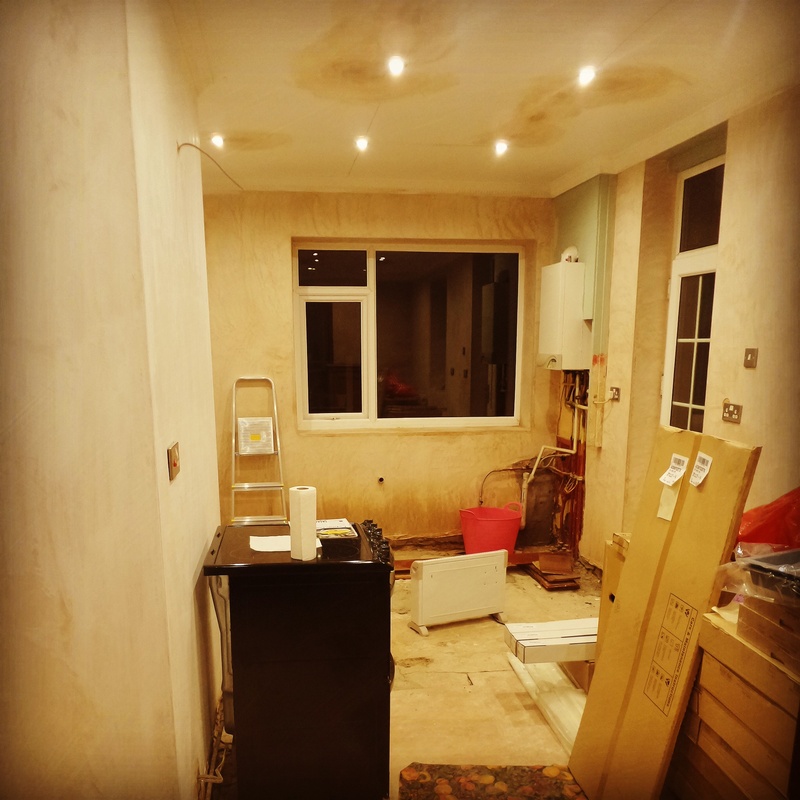 A further 10 minutes of kneading (tracked by my faithful hamburger timer) and I was STILL windowless… I asked Chris to have a go with his brute strength and STILL no window. 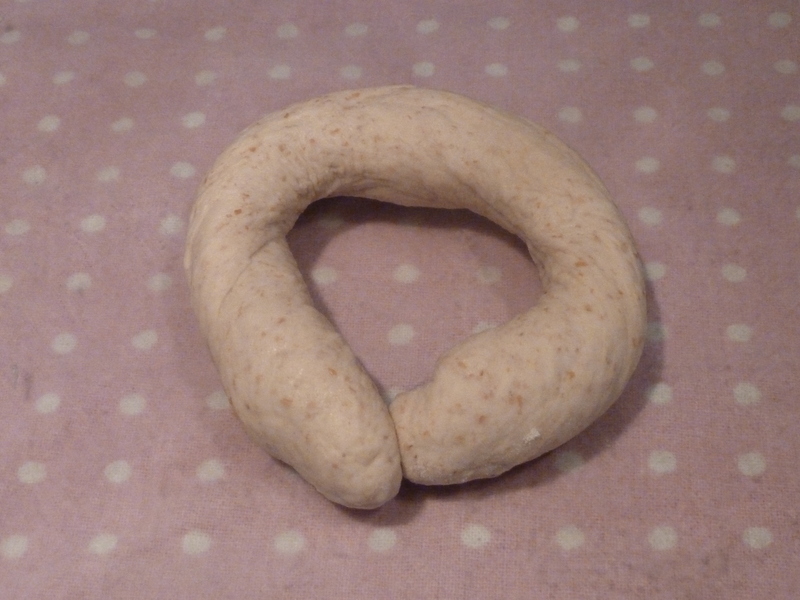 So I gave up comforted slightly that the dough had been kneaded at least twice as long as it was supposed to be and it did bounce back when prodded with my finger. 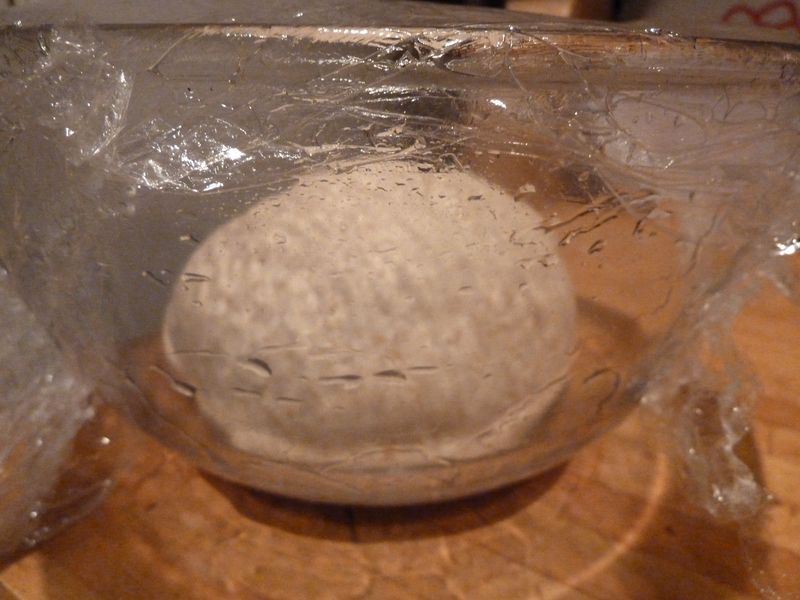 I left the ball of dough to prove and double in size over night in a greased bowl covered with greased cling film. Et voila! 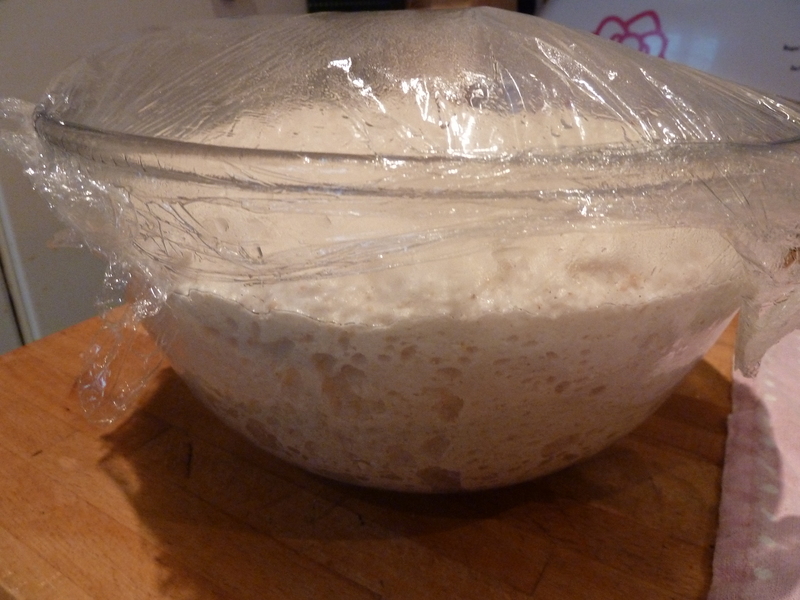 The next morning I awoke to beautifully risen dough. Punching it back I kneaded it thoroughly again (it’s a good job I do yoga press ups!) dividing the dough into 12 (equal-ish) portions I left it to rest for 5 minutes whilst I arranged the next stage. Water bath! Taking my largest soup pan I filled it about half way with water from the kettle. 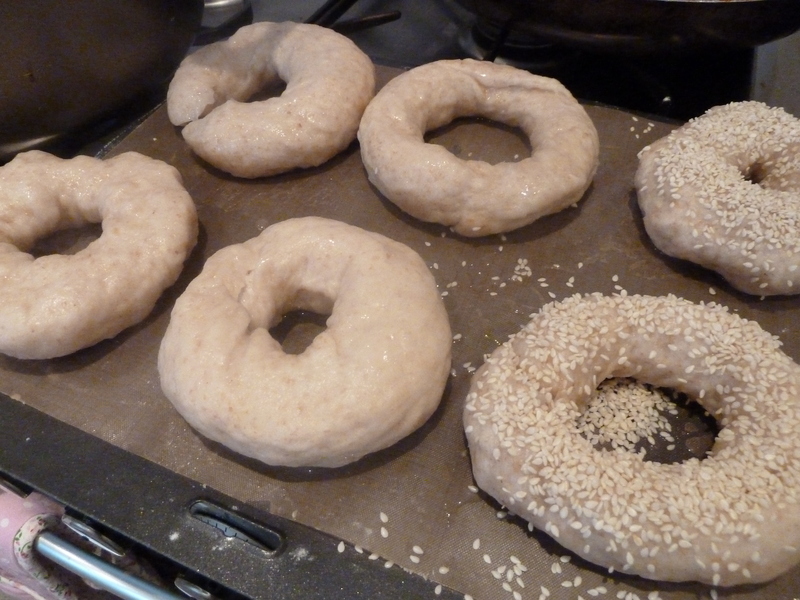 Then to shape the bagels. I tried a few different methods to see which worked best and I think I prefer the traditional method. 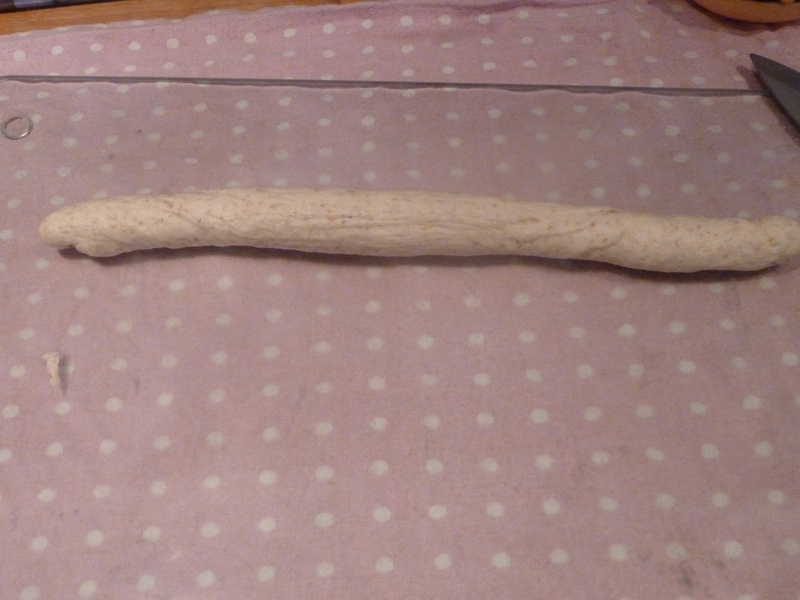 Roll a long sausage about 20 cms long) of dough and shape it into a circle. Fold the loose ends together and squash them together. 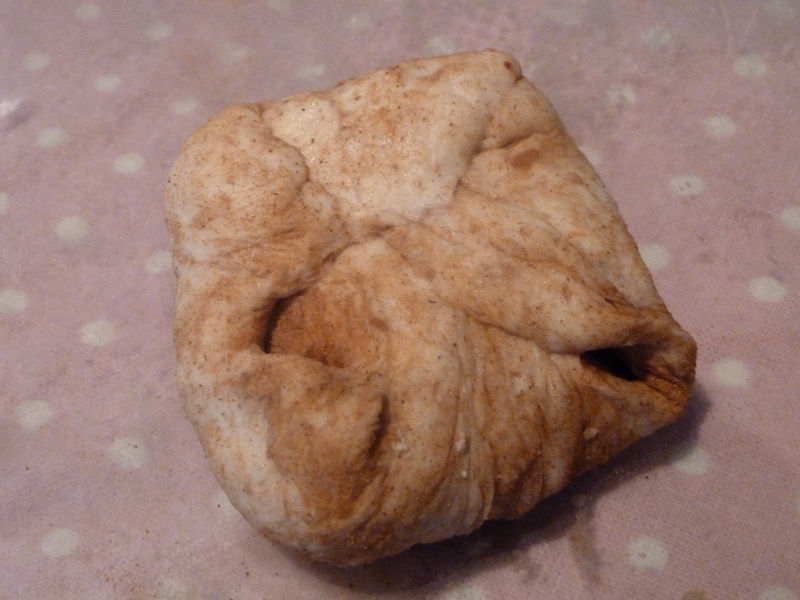 Then put your hand through the ‘hole’ in the centre and roll the join together until the two ends are firmly merged. 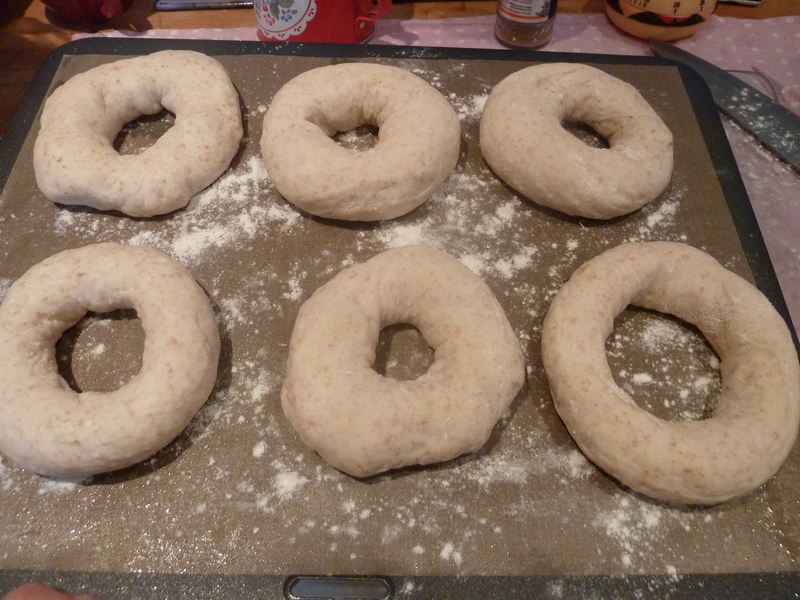 Then if required roll the rest of the dough ring in the same way to even up the dough and shape it into a bagel. The other method is more modern and maybe slightly quicker. 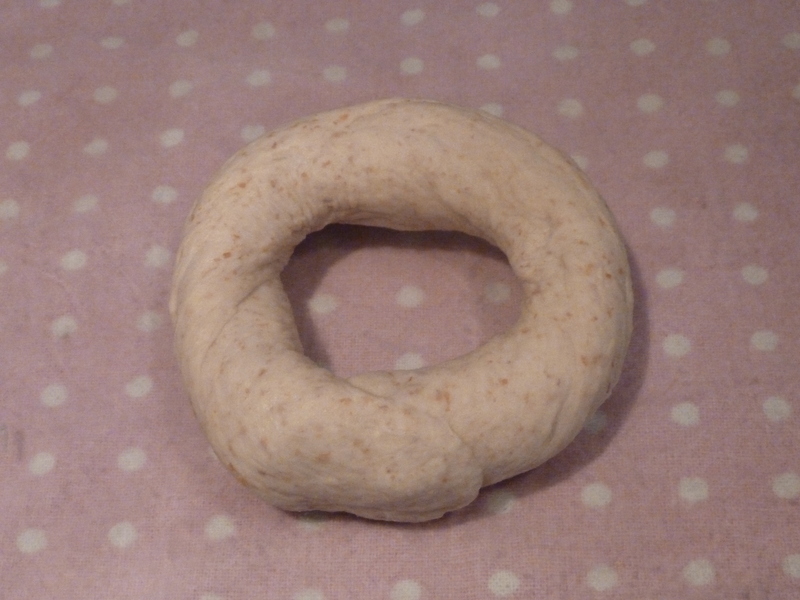 Where you shape the dough into a ball, flatten it, poke your thumb through the centre and then whilst holding the dough in your palm squeeze around the dough to widen the hole and shape the dough into a bagel. 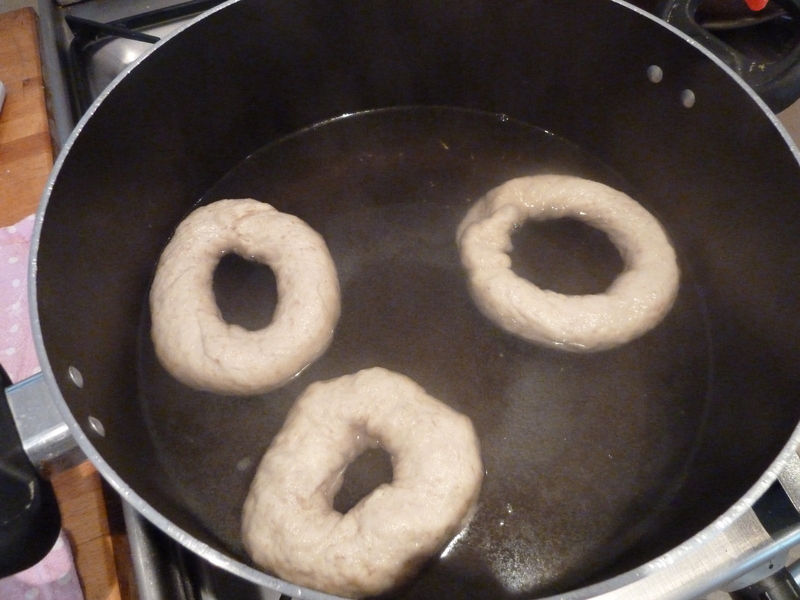 Once shaped the bagels need to prove for about 30 minutes under a damp tea towel or greased cling film at which point you can start to warm up the oven and water so it’s simmering nicely. 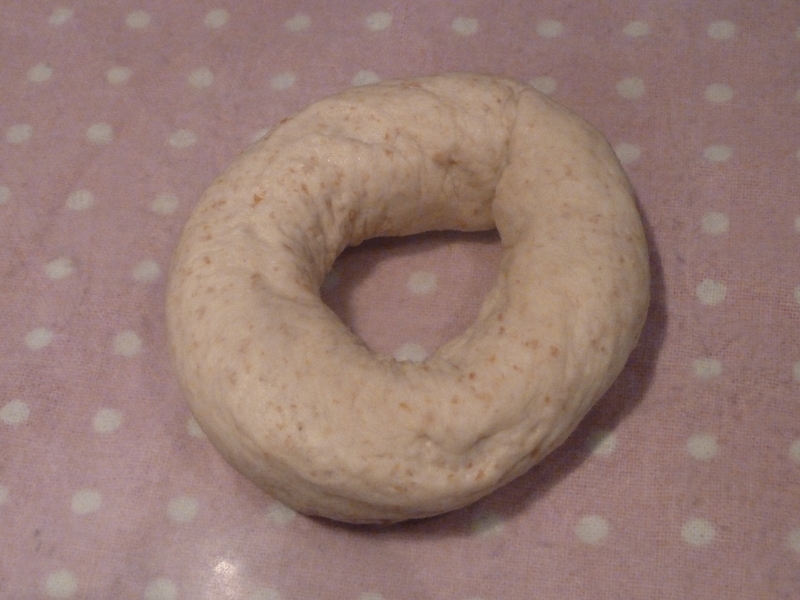 If you want to add flavouring to your bagels you can add toppings like sesame or poppy seeds after the poaching stage, but if you like your bagels fruity on the inside (like me) then you will have to add your chosen flavour before you shape the bagels. I chose to make half savoury and half sweet. 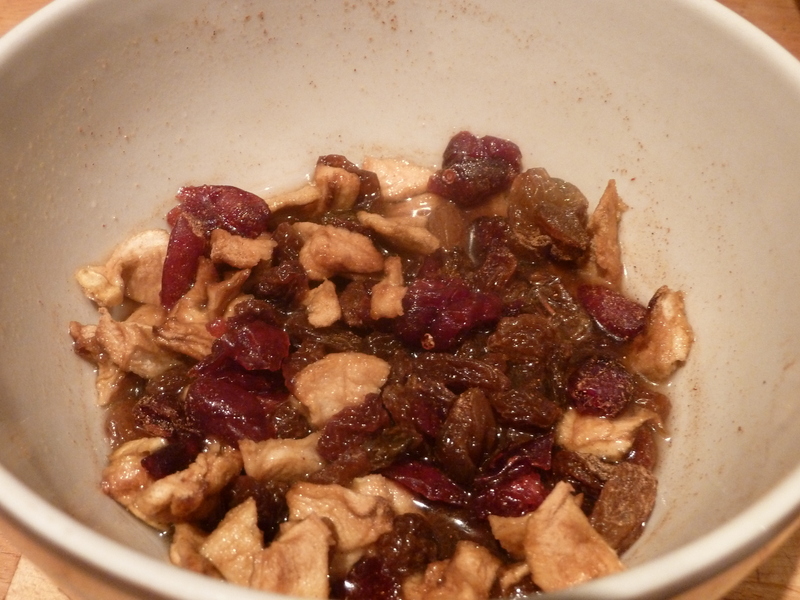 I pre soaked some dried fruit, raisins, apple and cranberries overnight in a little boiling water with a dash of cinnamon. 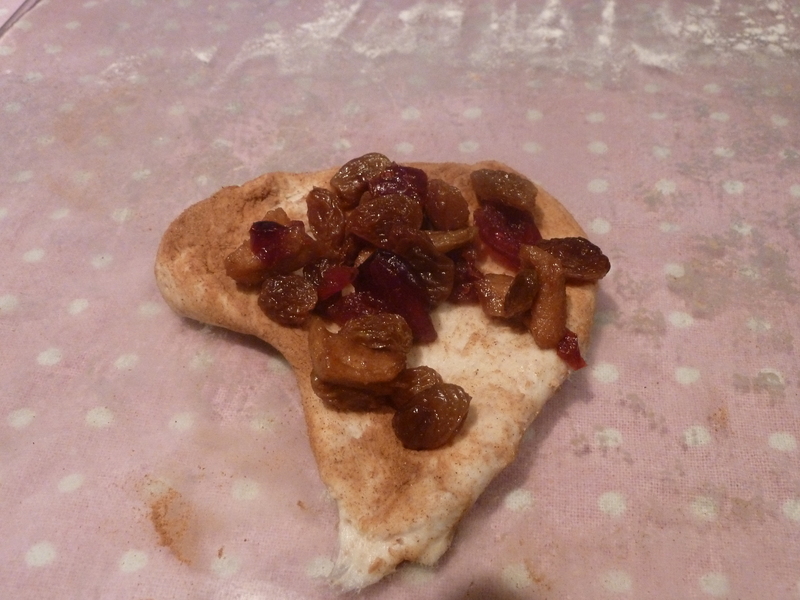 Drained off the excess water and folded in a teaspoon (or 2) of the fruit along with an extra sprinkle of cinnamon into the dough before shaping it. It makes the bagel a bit unpredictable with spots of fruit poking out all over the place but I found if I sealed the fruit into the dough and then shaped it, it was a little easier. 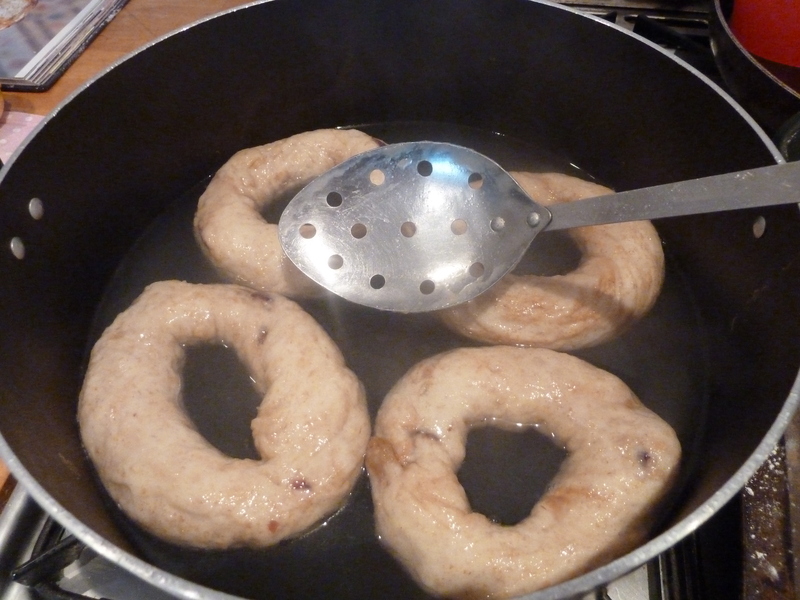 Then all you have to do is plonk the bagels into your pan of simmering water for 2 minutes (turning them over half way through for an even poach). 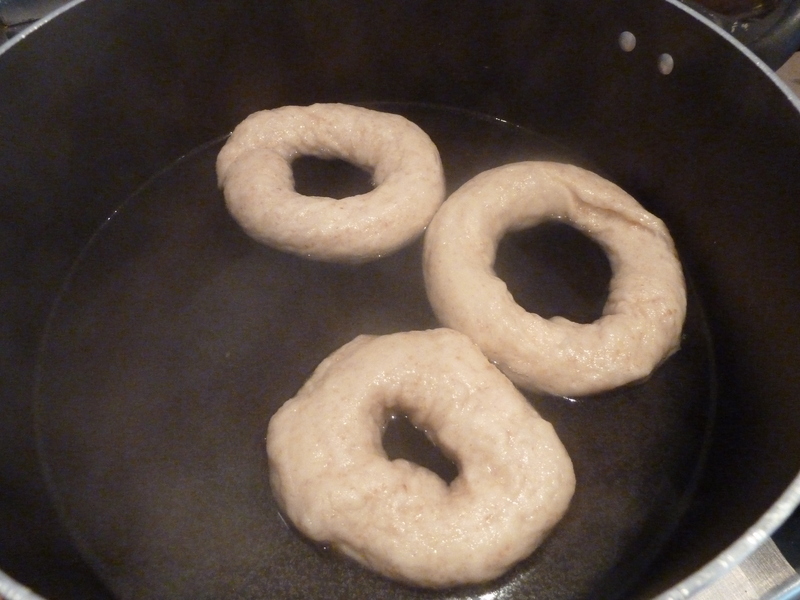 The bagels do expand slightly so don’t over fill your pan, do them in batches so they have room to breathe. Then out of the pan an into the oven! I used my Nana’s slotted spoon to scoop the bagels out and drain off the water. Then gently pop then onto a lined baking tray (sprinkle on your choice of topping while the bagel is wet) and into the oven they go. This means you can have a continuous run of bagel poaching and baking until all of your bagels are baked. 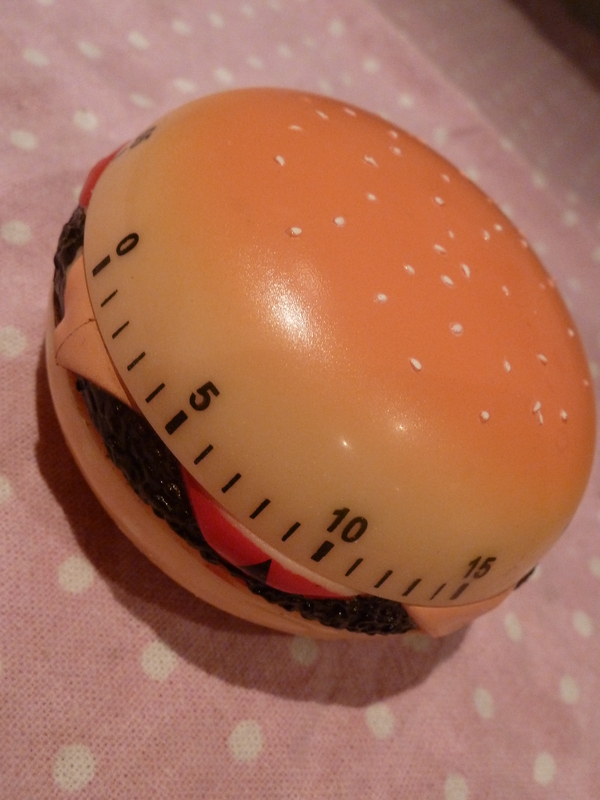 However this meant I was waiting for my breakfast for almost 2 hours. I ended up devouring 2 hot bagels and butter straight from the oven and they did not disappoint! Hot and buttery they were just what I needed. They are definitely easier to split down the middle when they’ve cooled a bit though. 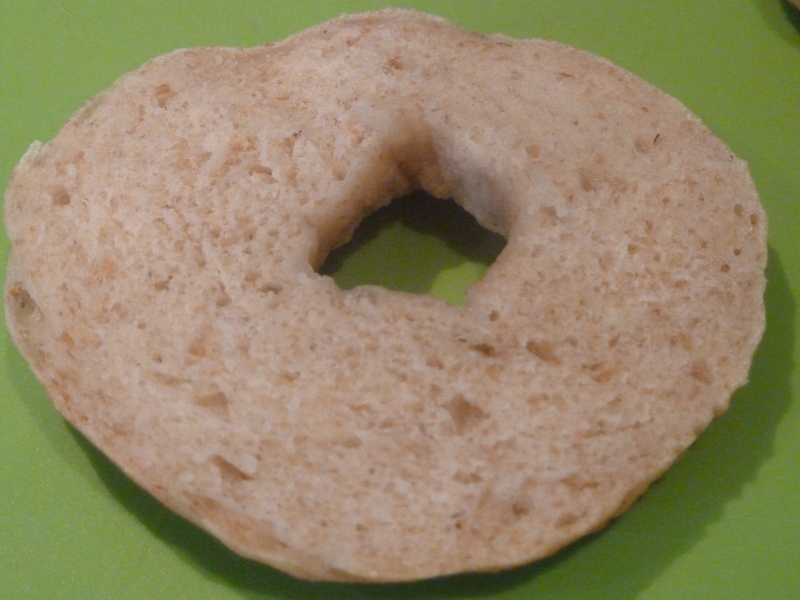 The plain bagels were easier to eat and even better toasted too to give an even crisp coating and chewy soft centre. I LOVED this bake. You know you’re making something special when it takes a bit more effort and skill. The fruity bagels were a little more moist in the middle, but this is what I had expected. 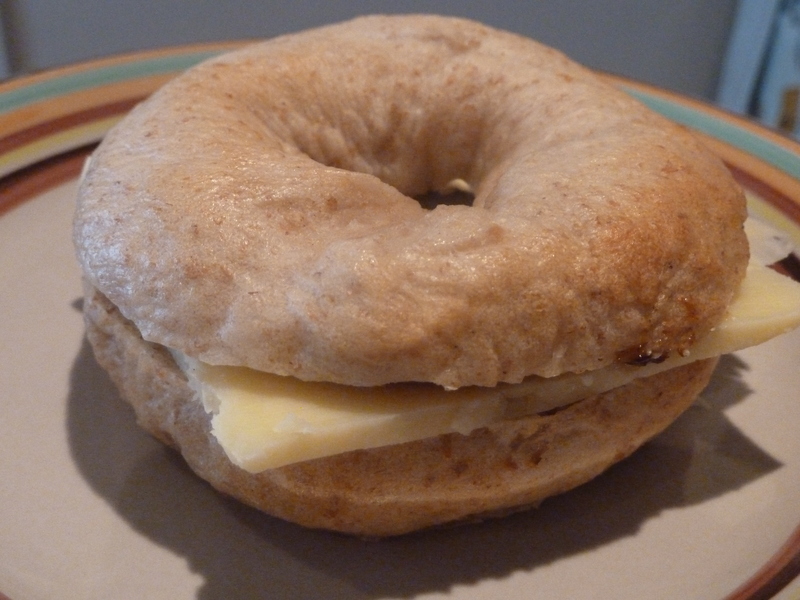 You can’t put fruit into a bagel without adding a bit of moisture. 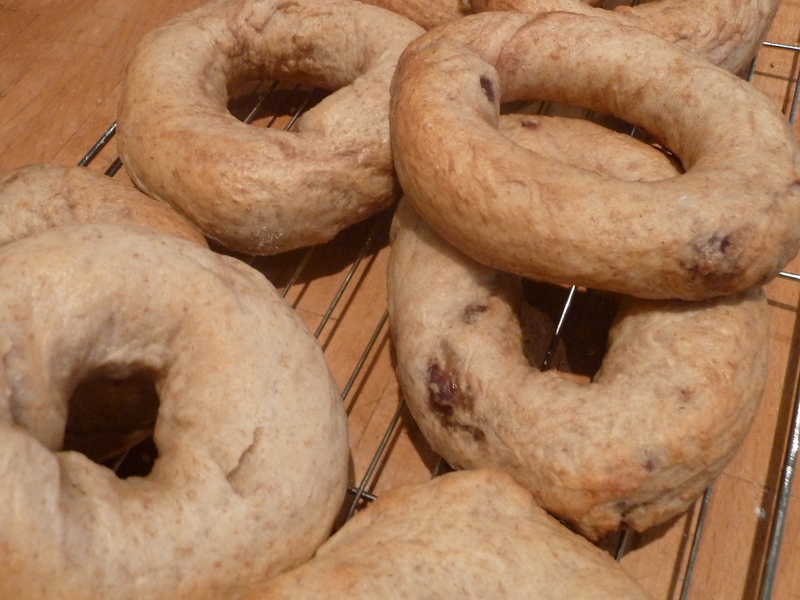 I would also add more cinnamon to the bagels as they weren’t quite cinnamony enough for me. 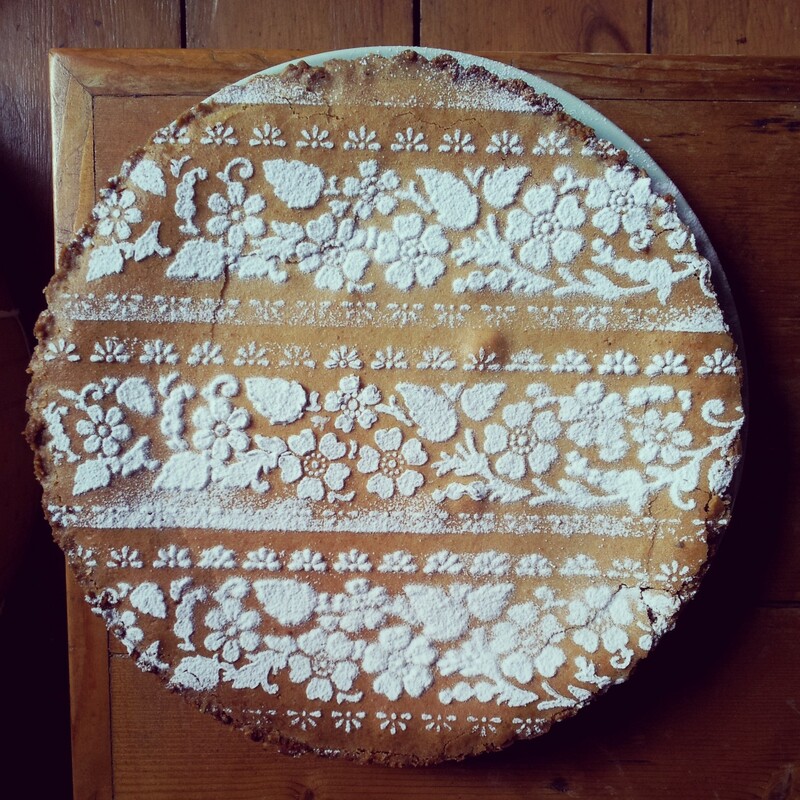 All in all a very good bake and I’m adding this to my baking repertoire now! In the midst of baking a double batch of Humming Bakery Brownies for the wonderful wedding of Jill and Jonny I got a bit carried away. Desperate to use my new Madeleine pan and the rest of the eggs that I bought I conjured up a milk chocolate version of the classic Hummingbird Brownie . 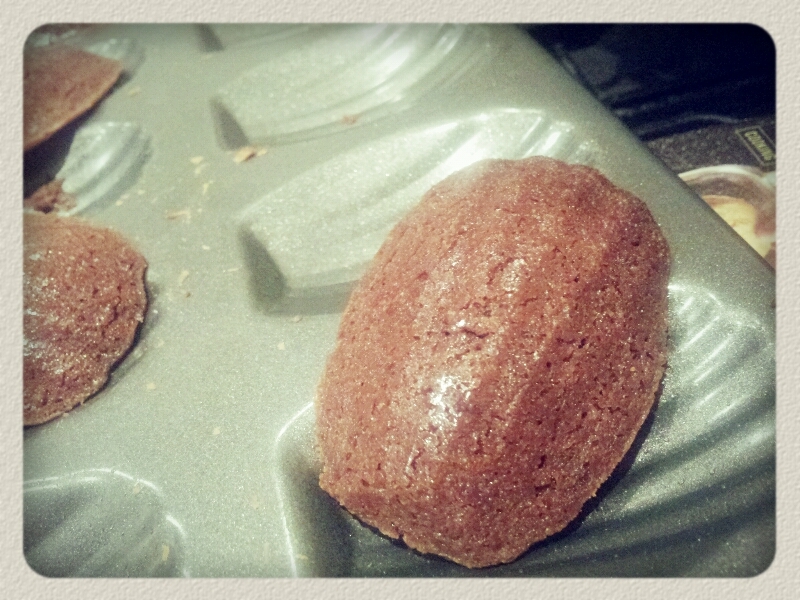 I’m not entirely sure that a Madeleine pan is intended for Brownie usage however I can recommend giving it a good go! 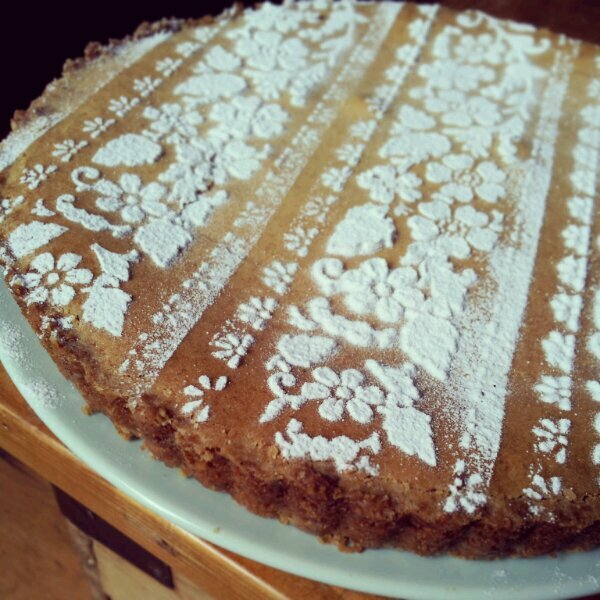 What is baking if not a bit of experimenting with unexpected cake shapes? If you’re looking for an odd adaptation of something special I’m your gal. 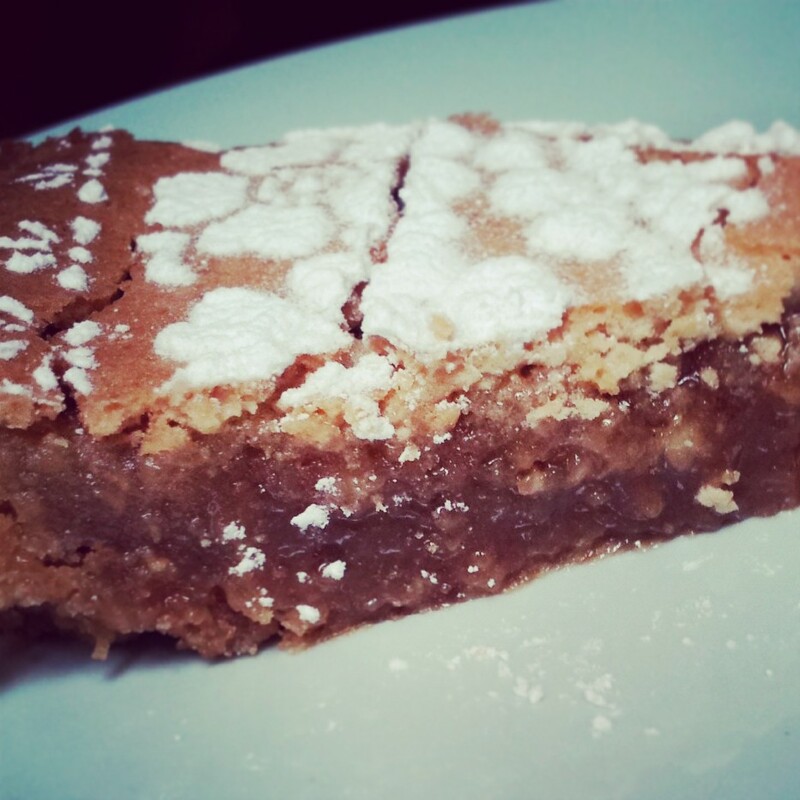 The original recipe and method can be found on my previous post for Jill and Jonny’s Wedding Brownies. My little mint plant was looking at me from the window sill so I decided to grab as many leaves as possible, chop them up finely and throw them into the mix. I substituted the dark green and blacks chocolate for a good quality milk chocolate and omitted adding additional chocolate chips to give a smoother finish. 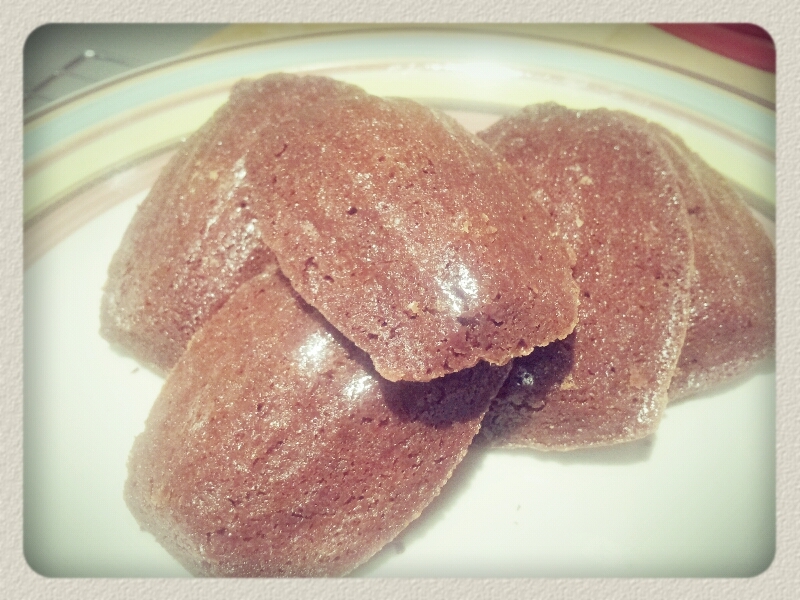 An extra slosh of peppermint extract for good luck and I spooned the shiny mix into my pre greased Madeleine pan. Carefully filling the pan only 2 thirds full so to avoid overspill. 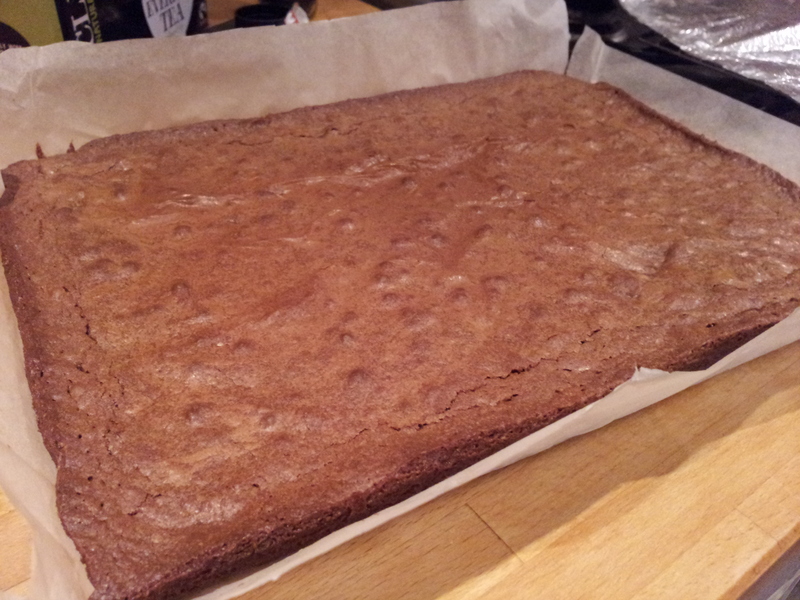 The tray needed a good wipe too before heading into the oven due to a lot of Brownie dribbling all over. I baked them for 15 to 20 minutes at 175 degrees, until the skewer comes out clean, et voila! They had to cool completely in the pan before attempting to coax them out with a knife. Even then I had to bang the tray on the table a few times as a few were a bit overly attached to the pan. 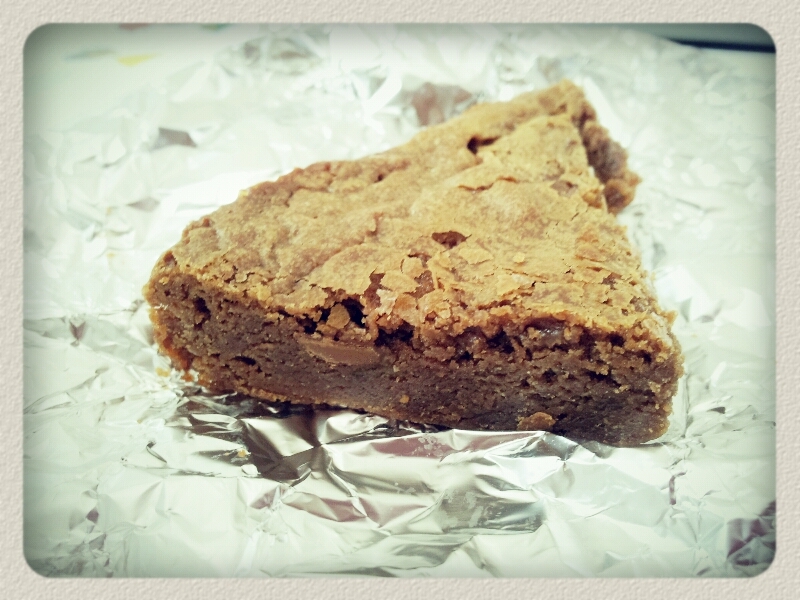 Some of the brownies left a little piece of themselves stuck to the pan but I don’t mind eating the holey brownies! 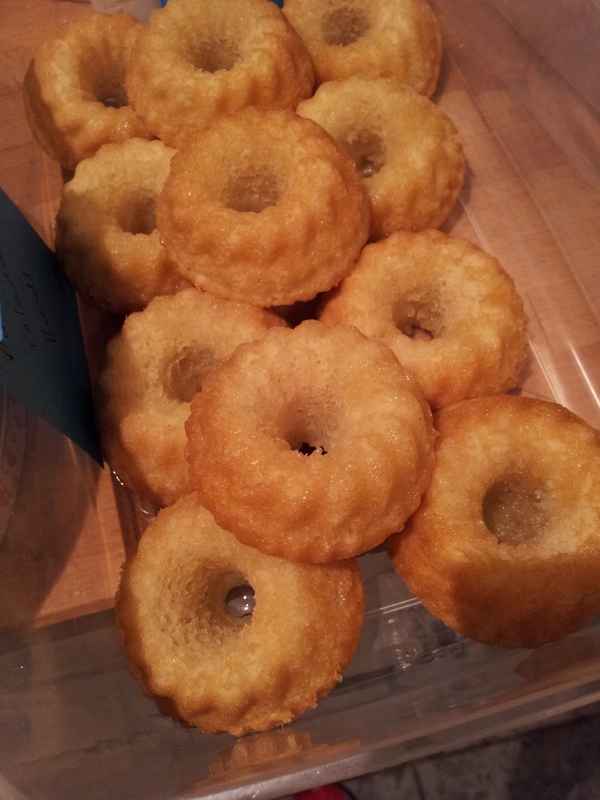 The fully intact mint Madeleine brownies were then wrapped up and whisked away to join in the wedding day celebrations! I’m baking a little something for my friends’ wedding day. Something that can be piled high and shared. I have baked rather a few Hummingbird Bakery things now from America but this is definitely my favourite brownie recipe. 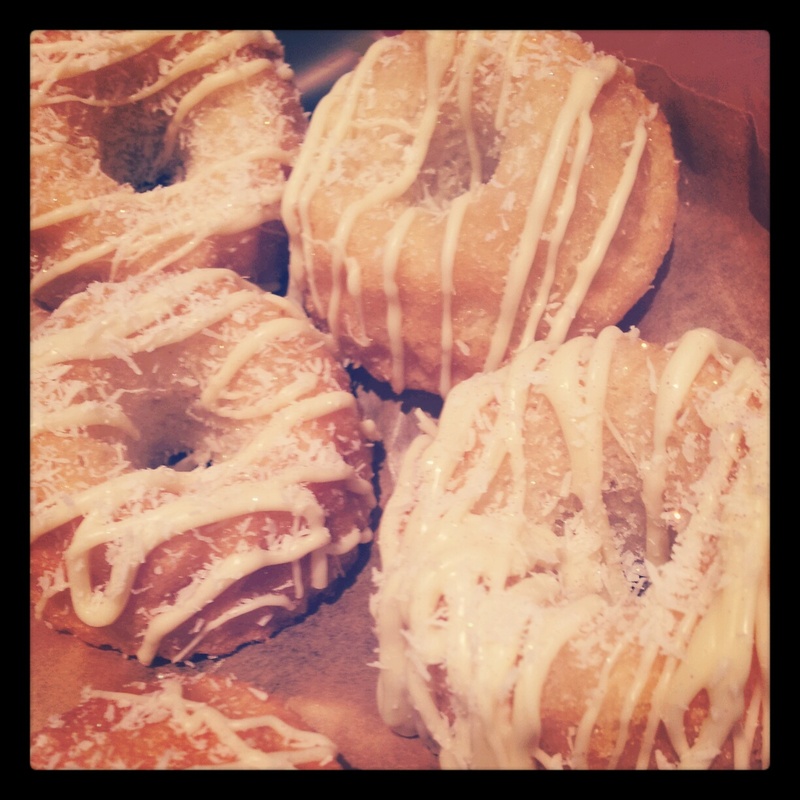 Nevertheless I still wanted to do a trial run to make sure they work (and taste good). When better to try them than at Jill’s hen weekend, this weekend. The trial run went so well Chris requested a second batch! 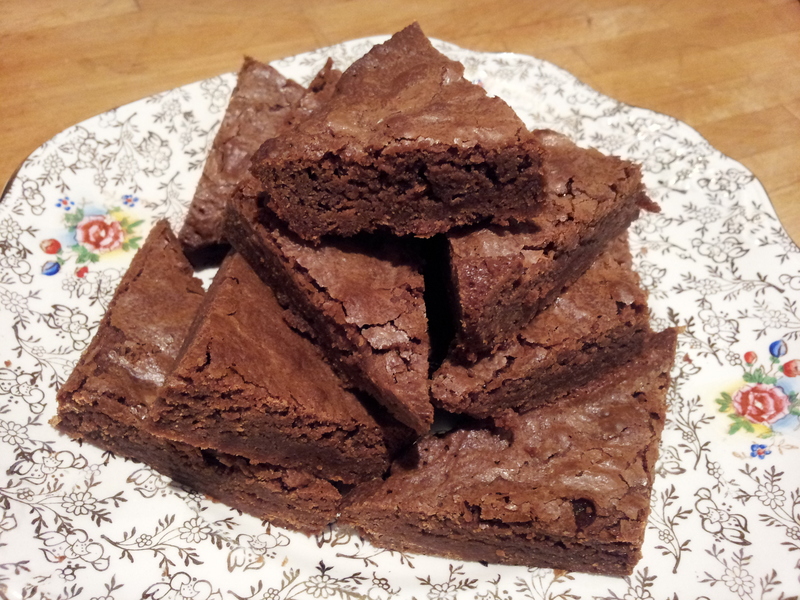 These Hummingbird Bakery Chocolate Brownies are rich, sweet and chewy with a delicate crumbly top. Perfect with a strong cup of coffee. A good sugar boost too to keep those energy levels up for wedding dancefloor action. This recipe is so quick I made the first batch in less time than it took me to ruin two lots of pancake batter. The longest bit was waiting for the chocolate to melt. I love how this recipe requires no whisking or sifting. 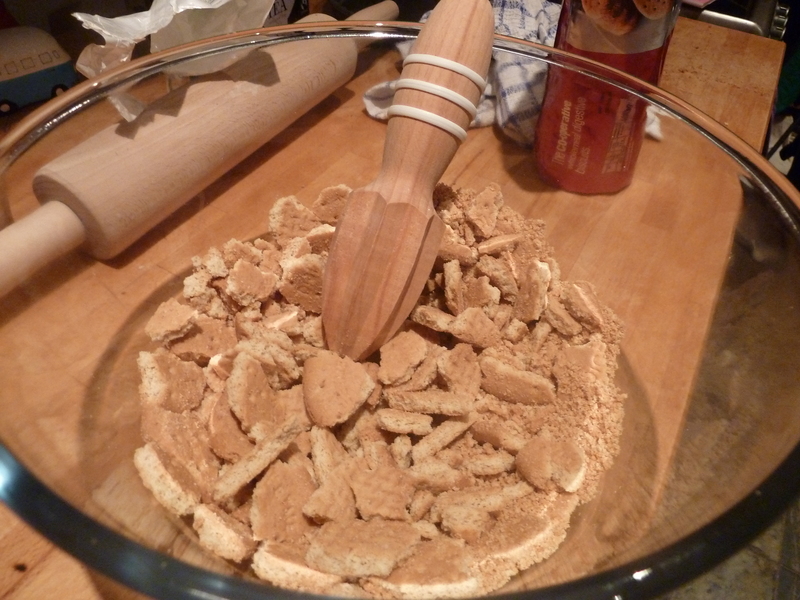 Simply stirring everything in one bowl with a wooden spoon means hardly any washing up too! You couldn’t even whip these up and freeze them for brownie emergencies. 1. 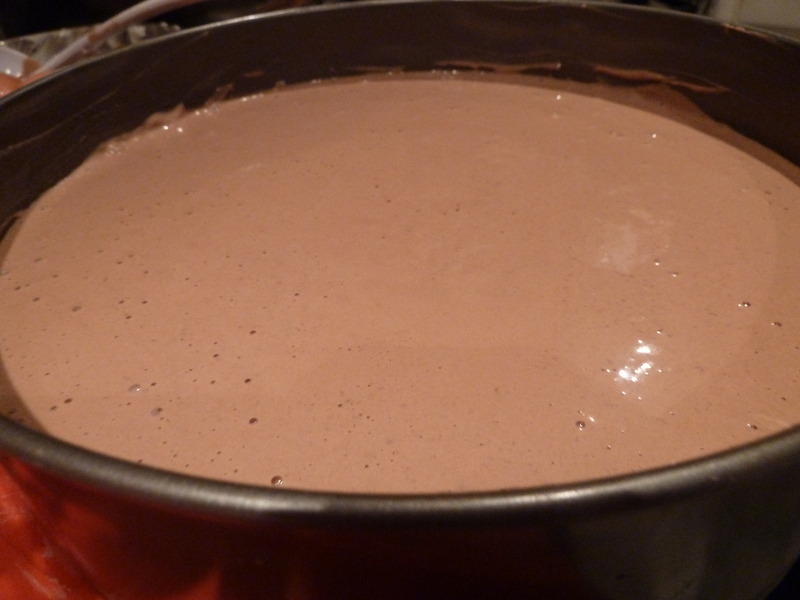 Melt 200 grams of good quality dark chocolate in a bain marie along with 175 grams of butter. 2. Make a cup of tea while this melts gently over a low heat. 3. Once melted stir in 325grams of sugar until it’s all combined. 4. 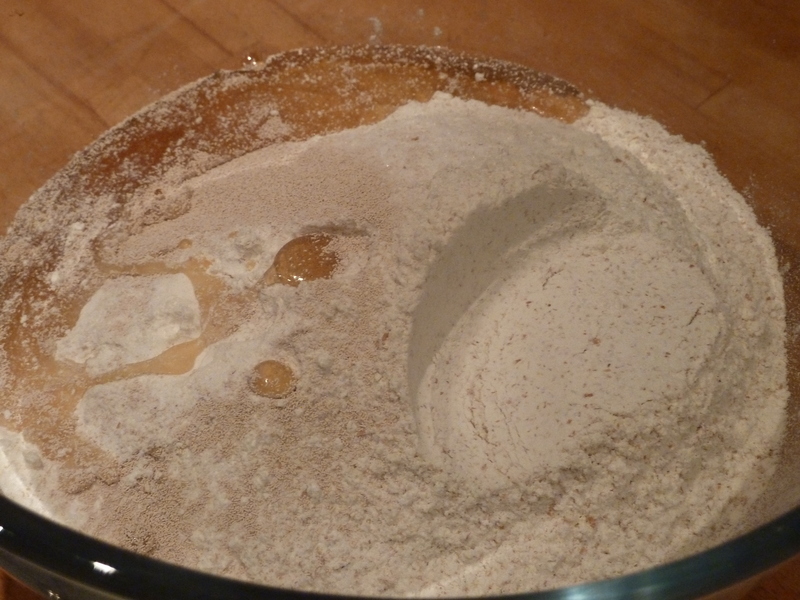 Then stir in 125grams if plain flour. 5. 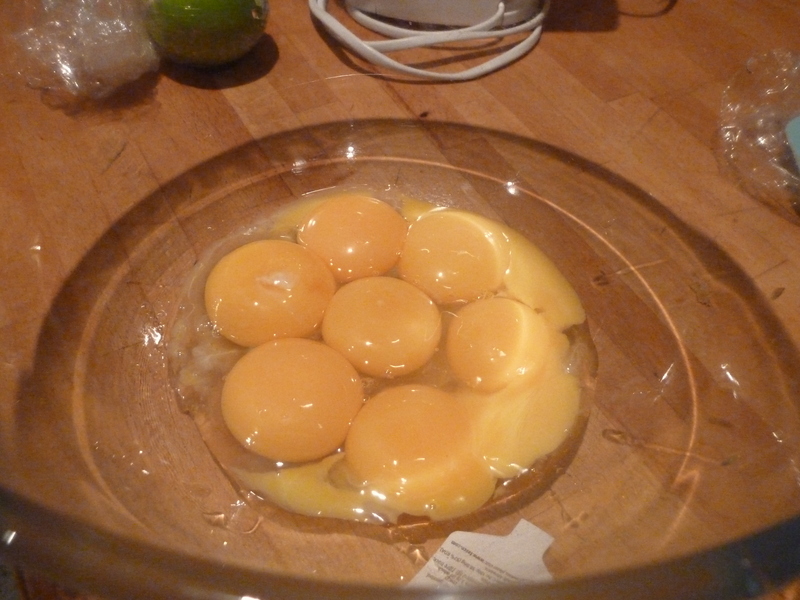 Stir in 3 largest eggs until you have a smooth paste. 9. Try to wait (if you can resist tucking into the tray with a spoon) until its cooled to chop it up and eat it as it tends to fall apart while it’s still warm… But this might be a good thing especially if you’re eating it with ice cream! 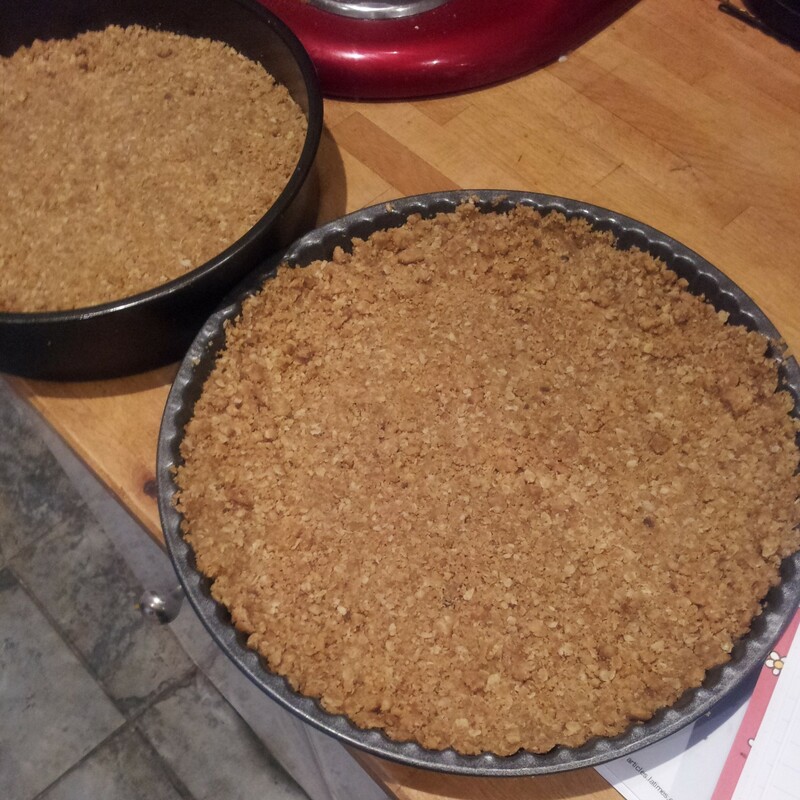 This recipe is supposed to be for 12 portions but I chopped it into smaller triangles and made about 30 servings. Recipe taken from the Hummingbird Bakery Cookbook. There seems to be a pattern emerging here. It was my friend Jenny’s birthday and I wanted to bake something special for her. When I asked what she would like her immediate response was ‘Key Lime Pie’. Your wish is my command. I’ve never had Key Lime Pie before but I immediately thought of the Hummingbird Bakery recipe that I had gazed at longingly many a time but had thought it was too complicated and messy to attempt. I would not let my niggling doubts defeat me. 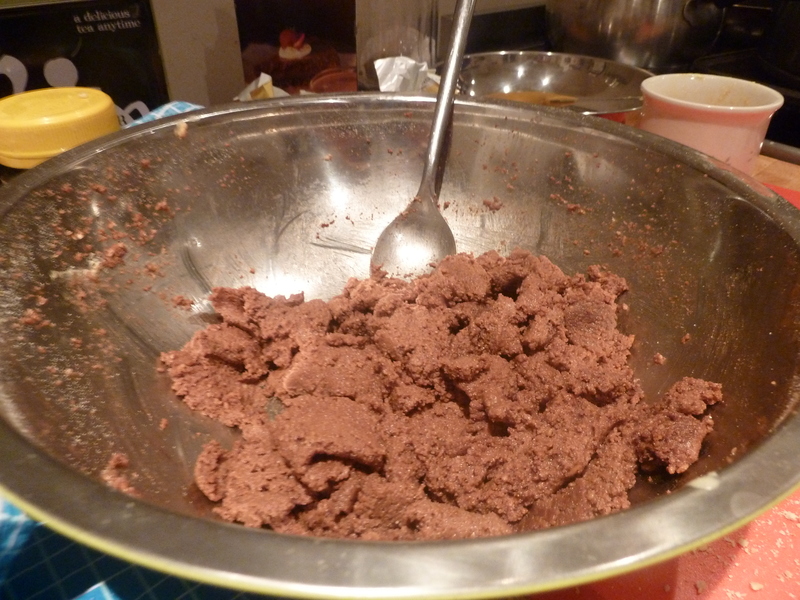 Again I had to shield my eyes from the flying digestive debris when I blitzed the shards with the hand blender. I may, or may not, have gone to work with crumbs in my hair. (It’s hard to tell with my curly mop sometimes). Can't fit any more biscuits in! 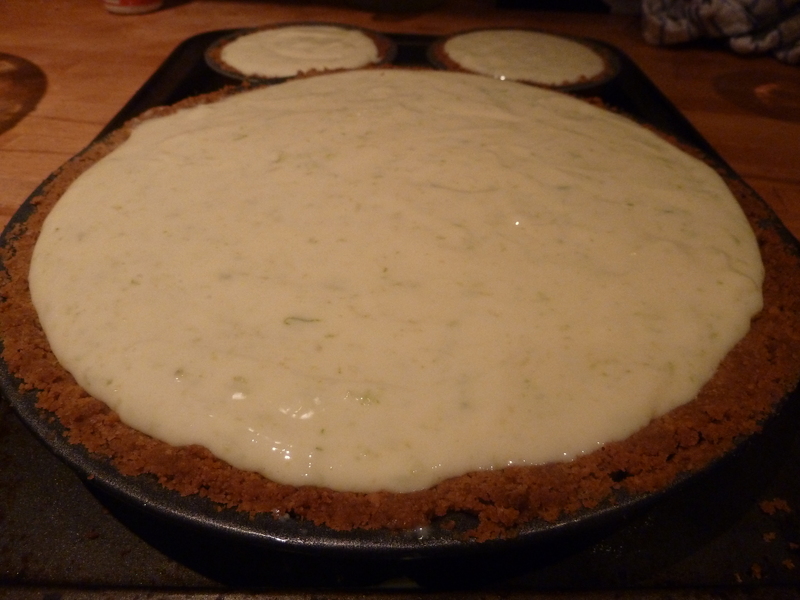 I had felt a bit guilty and frivoulous for buying mini pie dishes recently, but this Key Lime Pie emergency meant that I got to christen them! 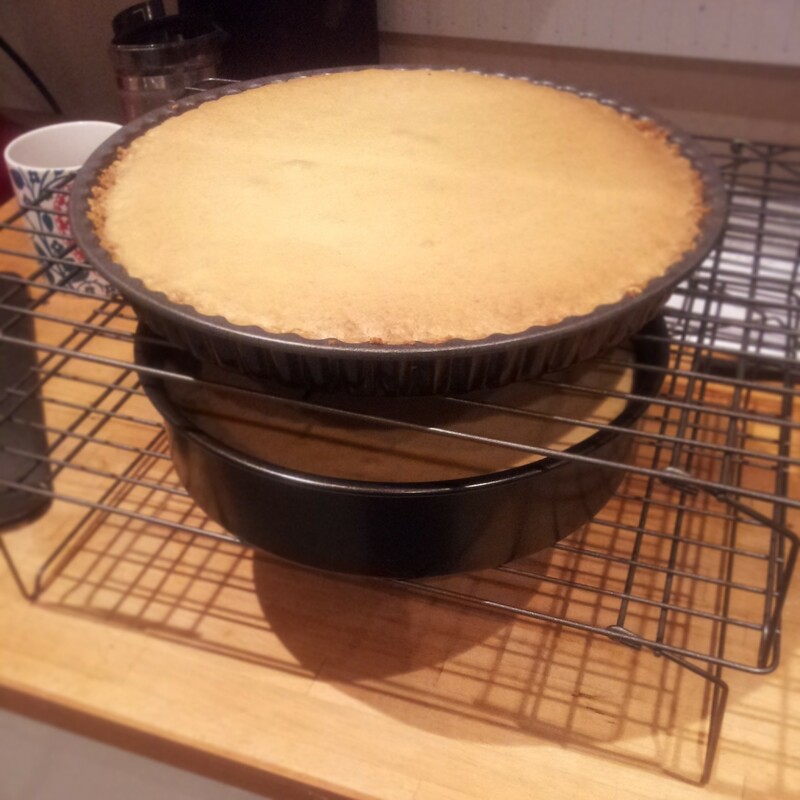 My sleepy brain missed a step in the recipe which said you bake the biscuit base and I assumed they would need to set in the fridge (hence the extra early preparations). Into the fridge they went to wait for me upon my return from work. 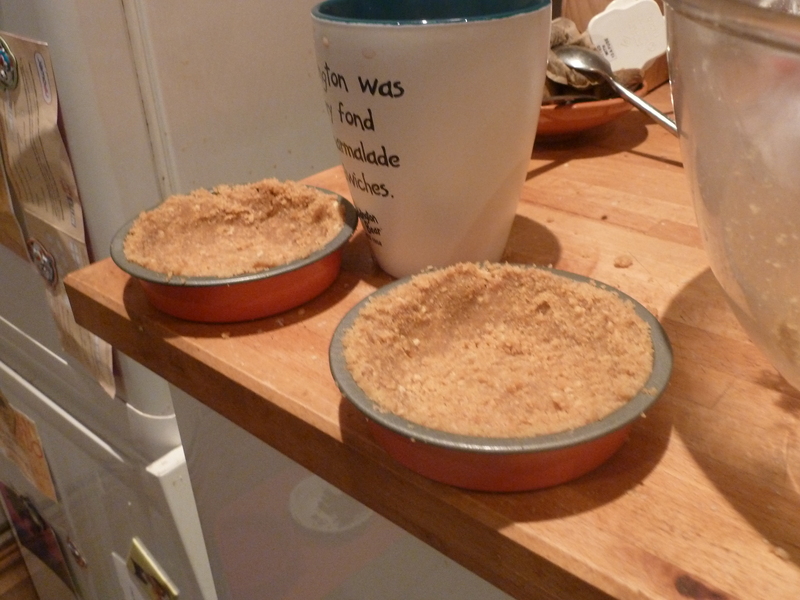 I realised that I had to bake the base and cool it before the lime filling could be poured in. 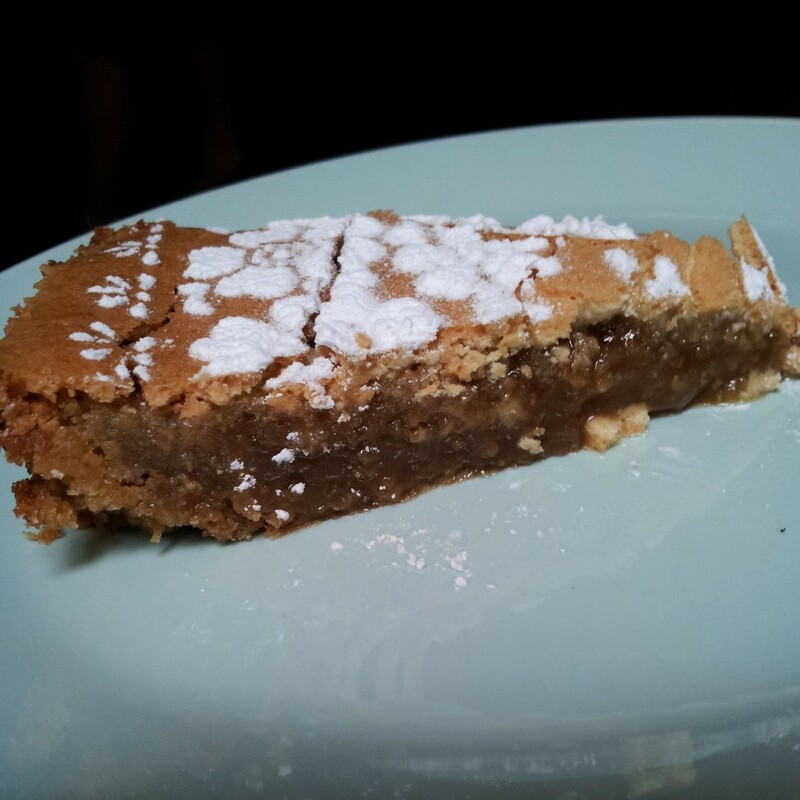 No baking beans needed for this inital bake unlike the Tarte au Citron. The grating and juicing of the limes was intense and made me crave a mojito. 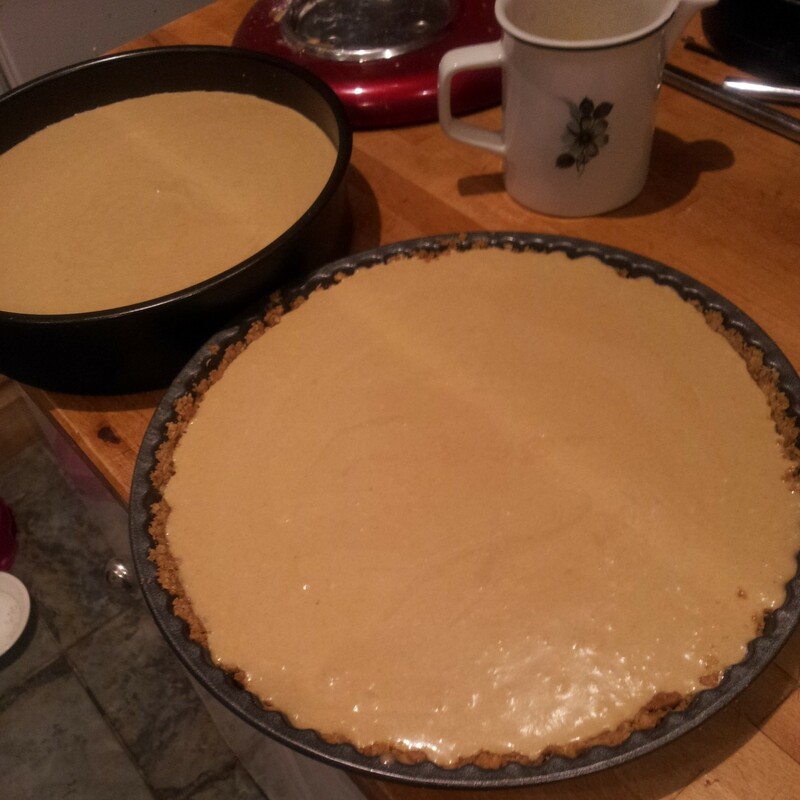 Once it was all grated I whisked it into the lashings of condensed milk and egg yolks, which I lovingly separated from their whites to save for the magnificent meringue. 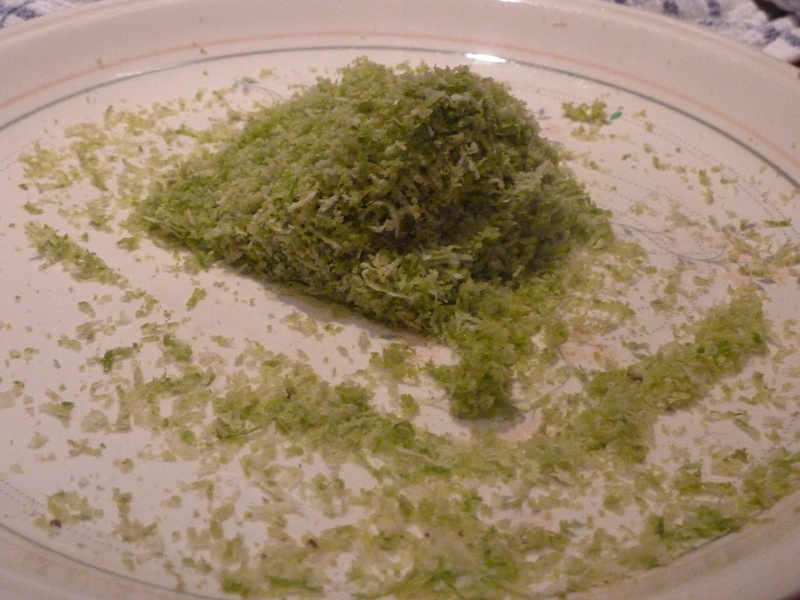 A lot of limes went into the making of this. 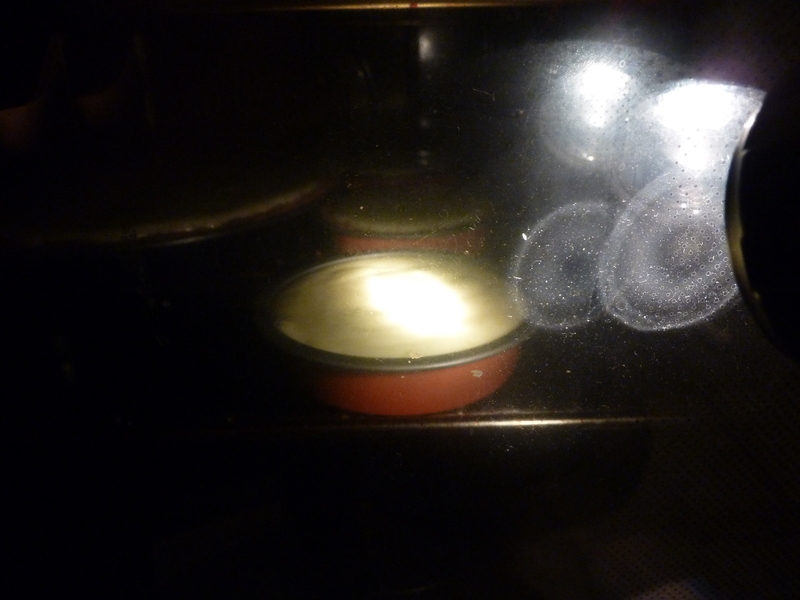 Then to pour the limey goodness onto the biscuit base which was now a thick greenish creamy paste and bake it in the oven. The lack of light in my oven could pose a problem for checking the bake, but I’ve lived with it for over 2 years now and found a torch is a handy cooking tool. Who needs a light inside their oven? Torches are the way forward. Is it done yet? 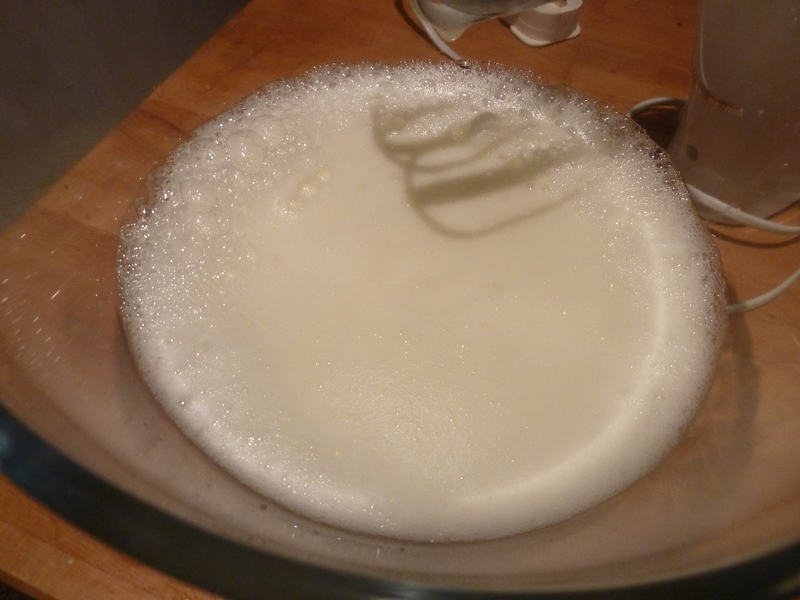 8 egg whites were whisked into a frothy frenzy whilst the sugar and water bubbled merrily on the stove. I couldn’t remember if you were supposed to stir sugar constantly or if it makes it return to it’s crystallised state, so I did a bit of both. Stir, let it bubble, stir again. It eventually reached what I assumed to be the ‘soft ball stage‘. A mystical sugary state that frankly I’ve never heard of before I attempted to make fudge the other week, which was a disaster, so I clearly can’t recognise this stage of sugary wonderment. To be on the safe side I let it bubble some more.. 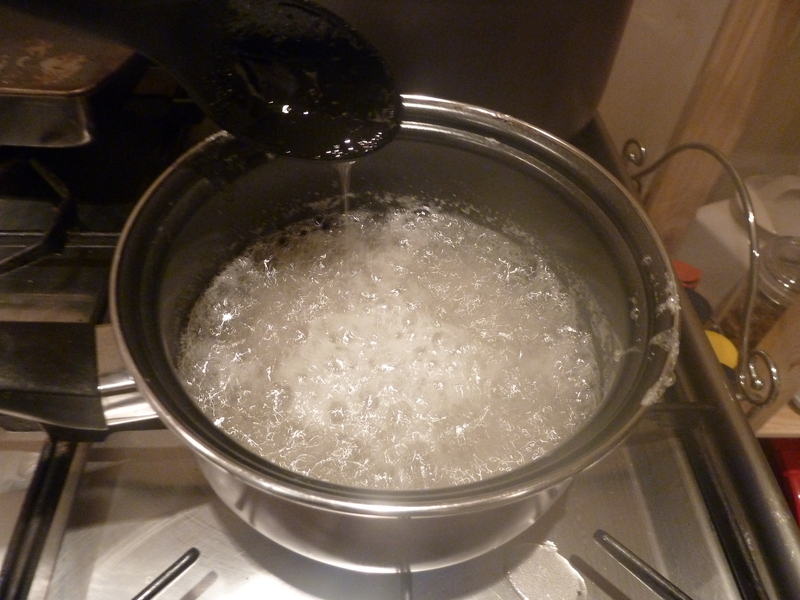 When the sugar is syrupy and hot enough it needs to be poured slowly into the egg whites whilst whisking it. It’s a good job I can multi task, as I poured the liquid molten lava with one hand and held the electric whisk with the other, praying I wouldn’t slip and scald myself. 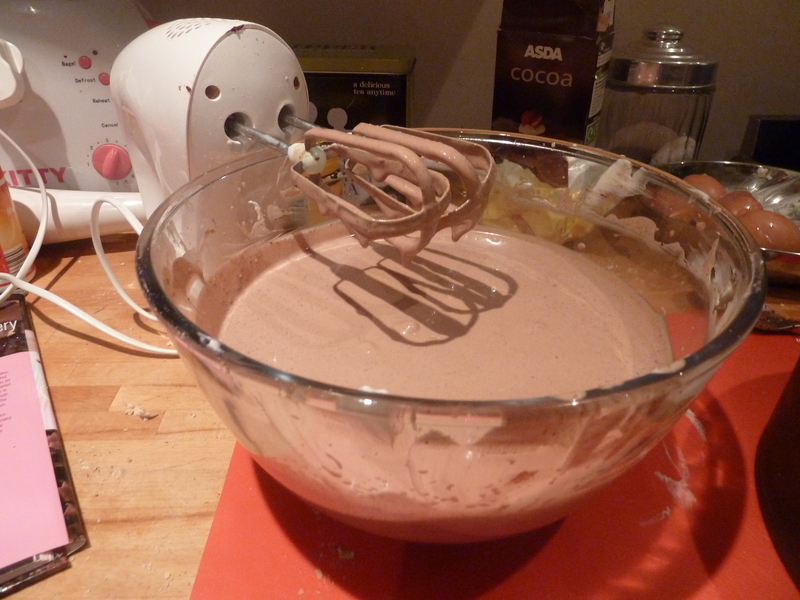 When I win the lottery I have promised myself a Kitchen Aid mixer (and a bigger kitchen). After sugar... I think the meringue's cooked! I think I may need a bigger bowl if I’m ever going to make this again. It was amazing. Compared to uncooked meringue this was like magic. It quadrupled in size and almost over flowed the bowl! 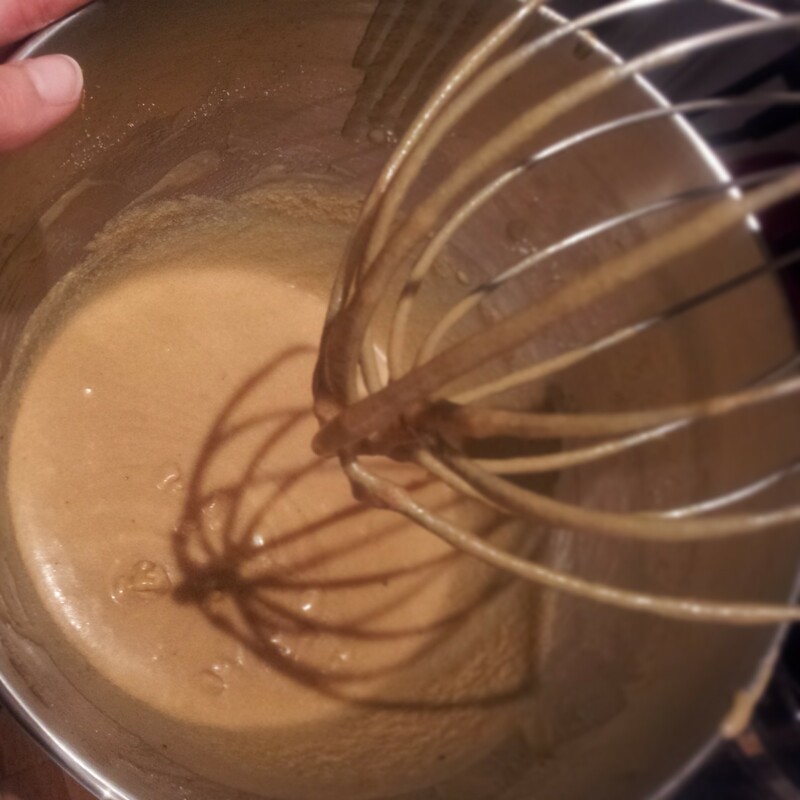 The only downside was after all the sugar was incorporated was that it involved 15 – 20 minutes of more whisking. Thank god for my little electric whisk and my ipod on random. Elvis and whisking. What can be better? 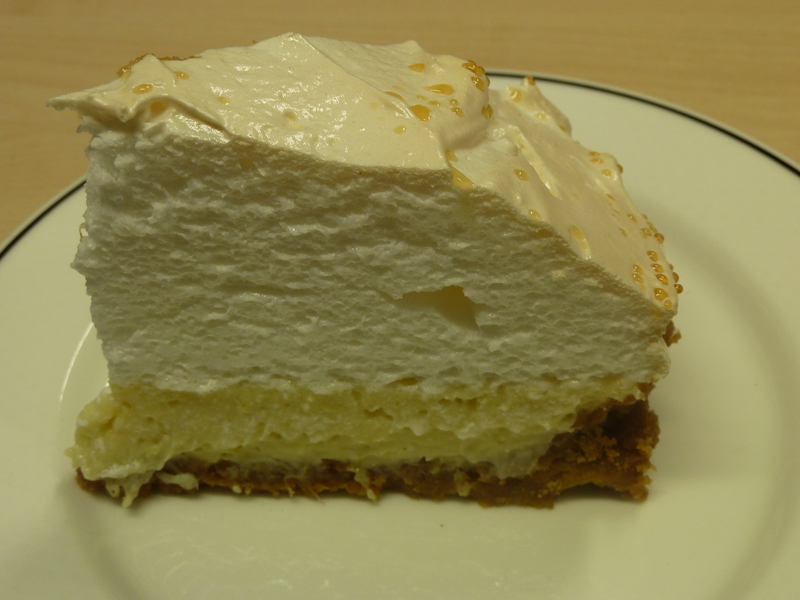 Once the meringue had cooled, it was cooked through and ready to be assembled on top of the lime pies. It was a sticky process. 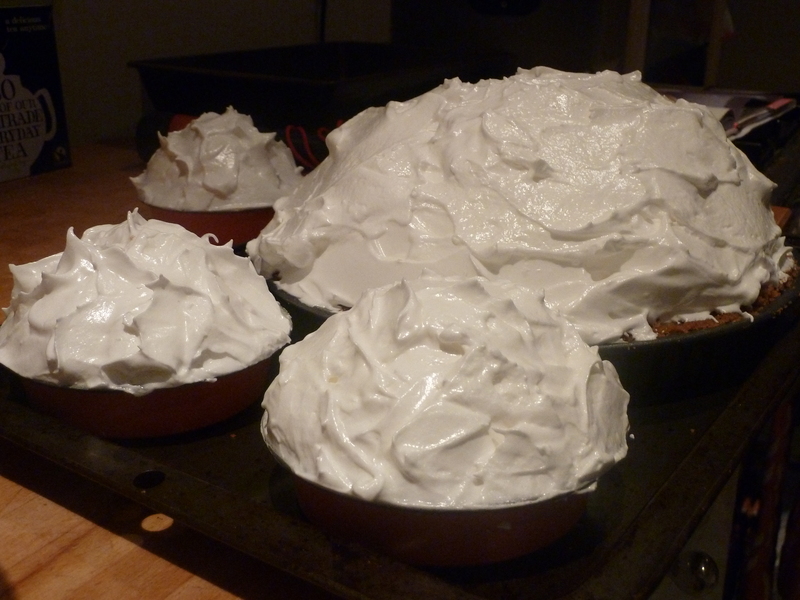 With each mountain of meringue in position I popped them all in the oven for the final bake! What a wonderful sight! So impressive! I struggled to get the pie into my cake box to transport to work. So cling wrapped it to the hilt and carried it like a baby. I got A LOT of smiles from strangers on my way to work that morning! Someone actually offered me their seat on the metro. It just goes to show people LOVE cake and Key Lime Pie is an attractive bake. This pie goes a long way. We shared it amongst 11 people and then I still had 3 mini pies at home! 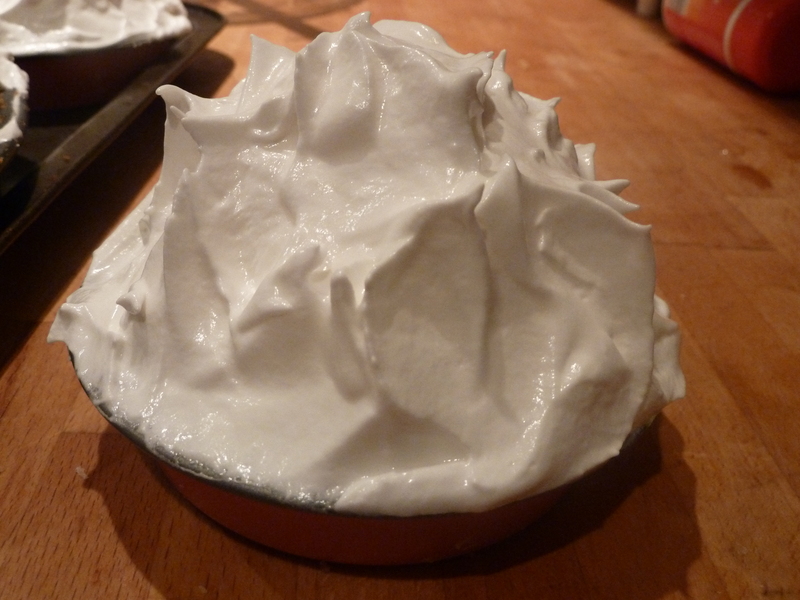 (don’t worry I didn’t eat them all by myself) The wonderfully sweet meringue balanced out the sharp and creamy lime. 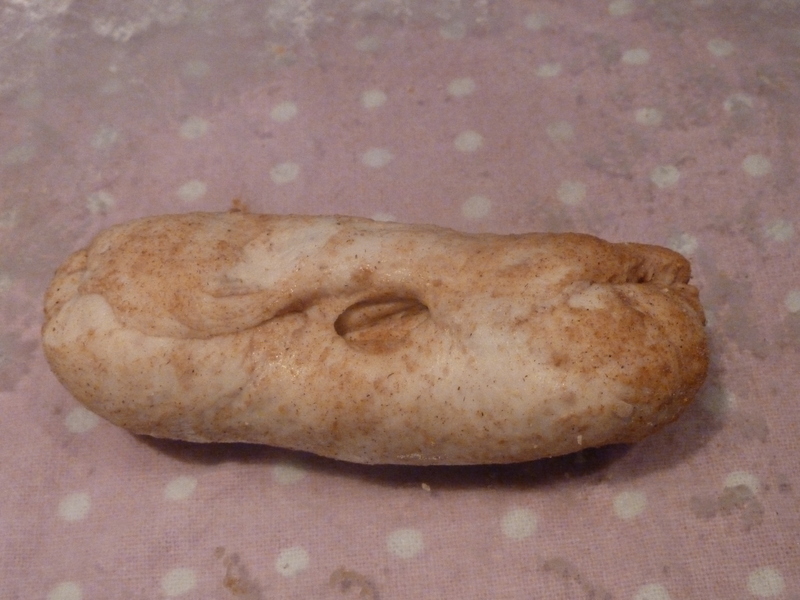 The digestive base tasted almost gingery after their third bake in the oven. Perhaps it was the addition of rich tea biscuits, whatever it was, it was wonderful. Heaven is a massive slice of Key Lime Pie. 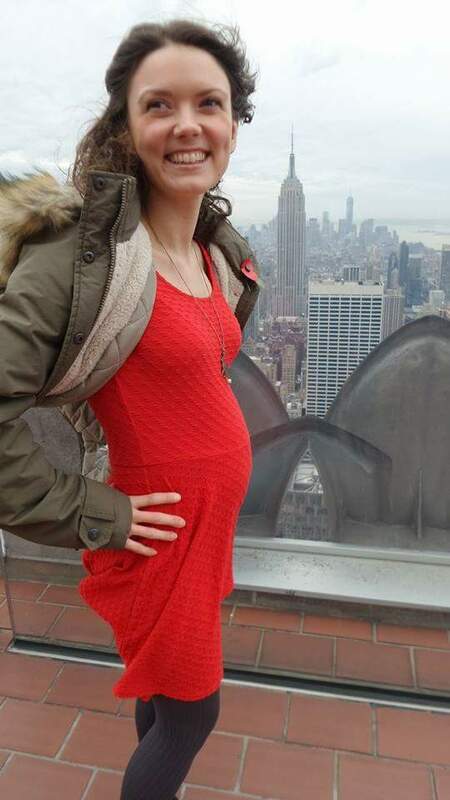 Happy Birthday Jenny! 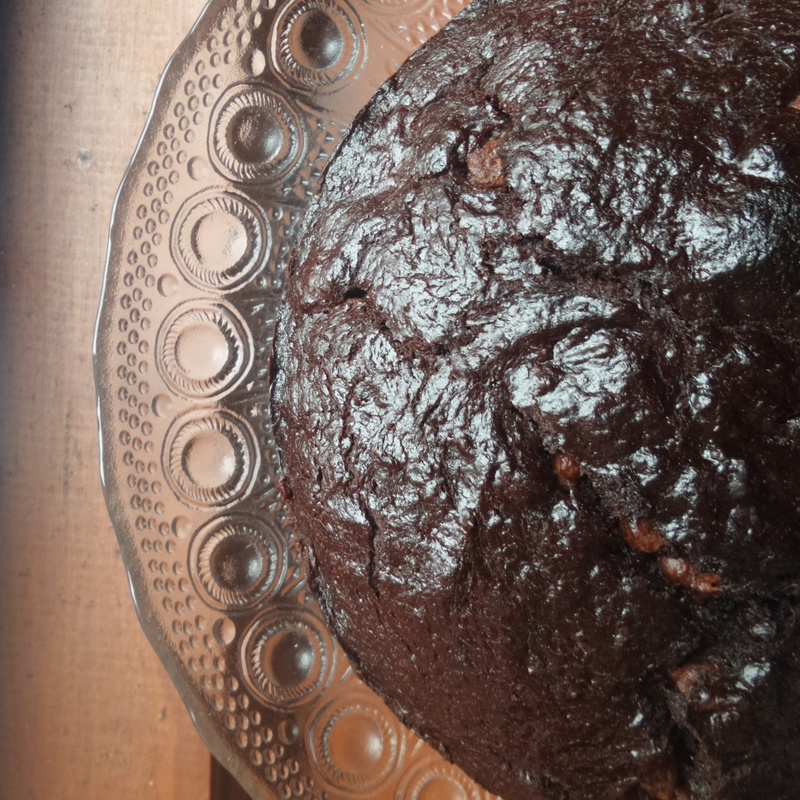 With it being Chocolate Week last week and National Baking Week this week, I thought I should bake something else chocolatey and lovely. 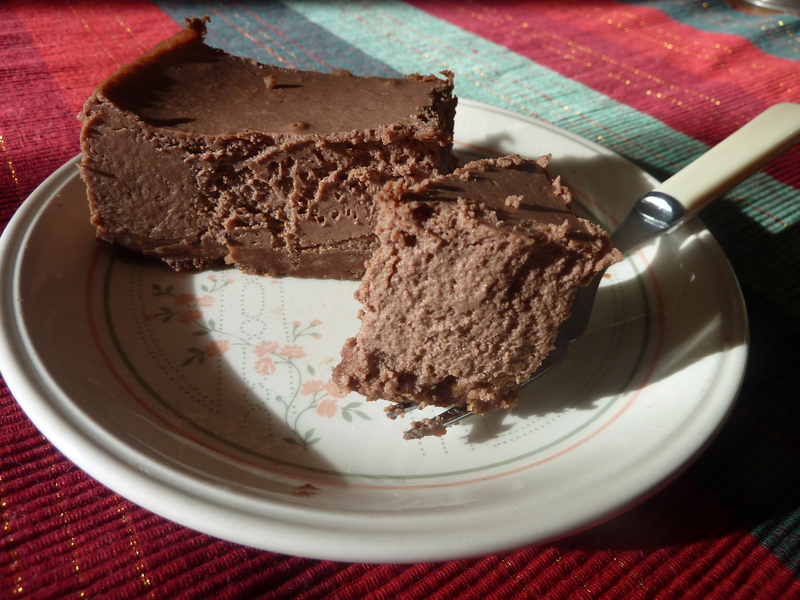 A triumphant return to America to one of the few Hummingbird Bakery Recipes that I was still to attempt… Baked Chocolate Cheesecake. 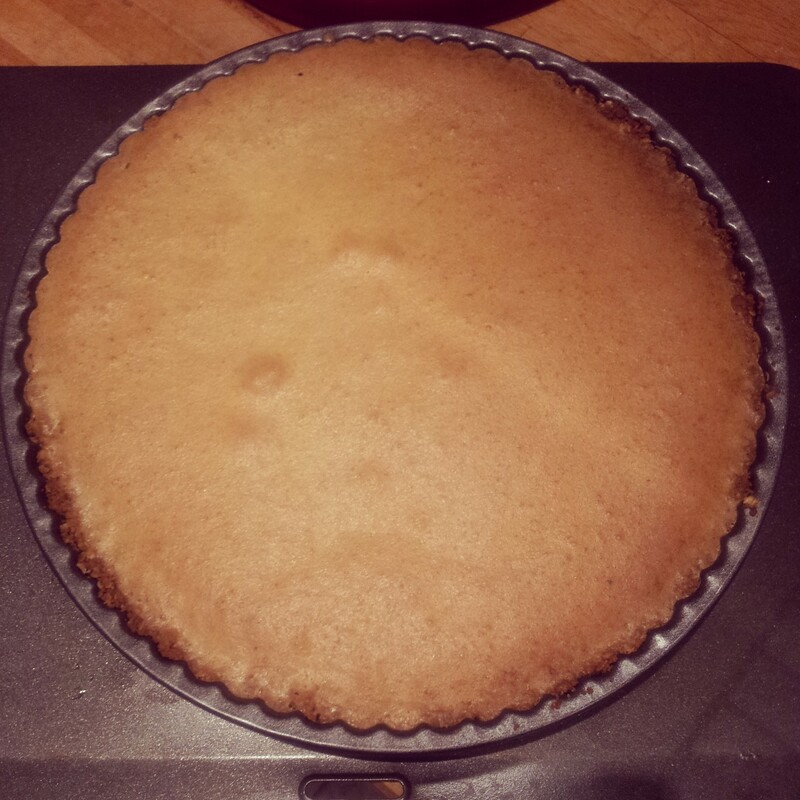 After watching the Baked Cheesecake GBBO episode I was aware of how tricky this would be. 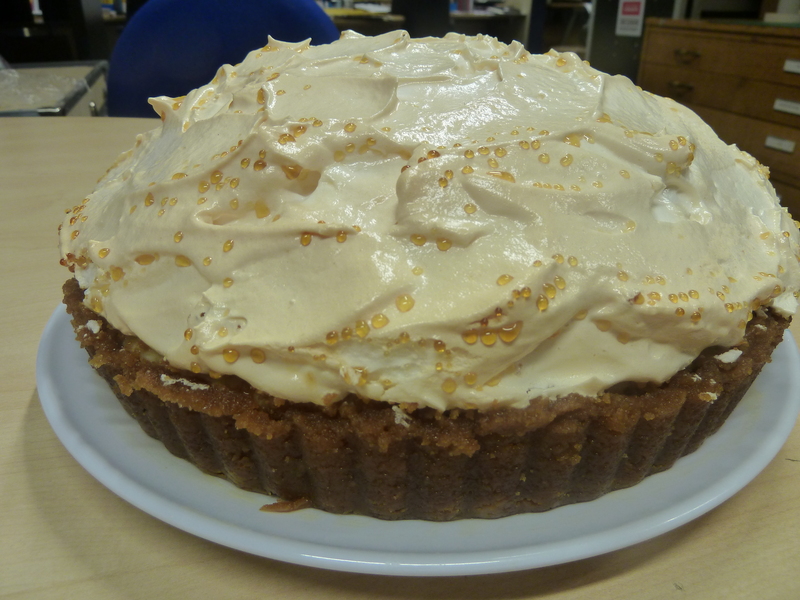 But I’m still dreaming about Jo’s Rum and Raisin Cheesecake! I was a little surprised in the supermarket when purchasing all the cream cheese needed for this one… 4 packets of cheese seems like a lot!! I decided to improvise with the biscuits as I already had rich tea in the house rather than buy digestives. That won’t make too much of a difference right? 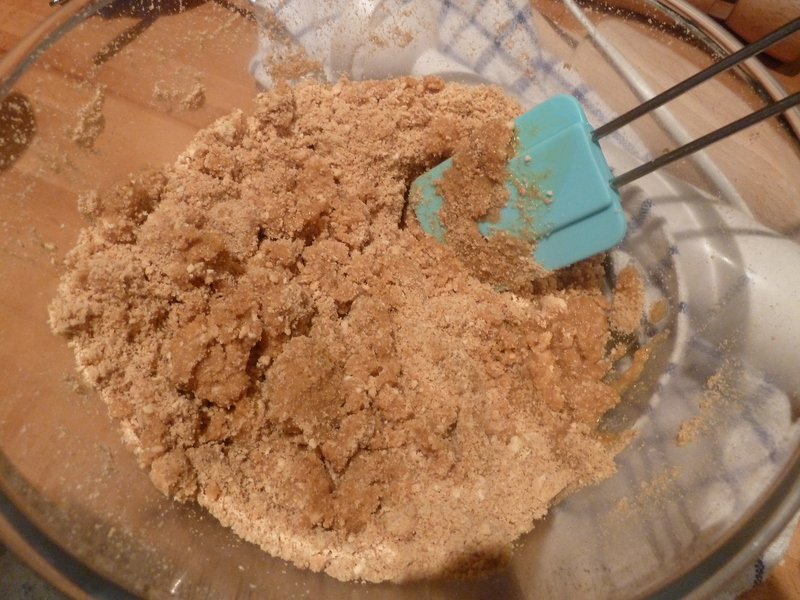 I must admit I was in a little bit of a hurry when putting this one together and roughly blended rich tea biscuits and cocoa powder into sweet dust which permeated the entire kitchen with my little hand whisk. An emergency tea towel was required to protect my eyes. 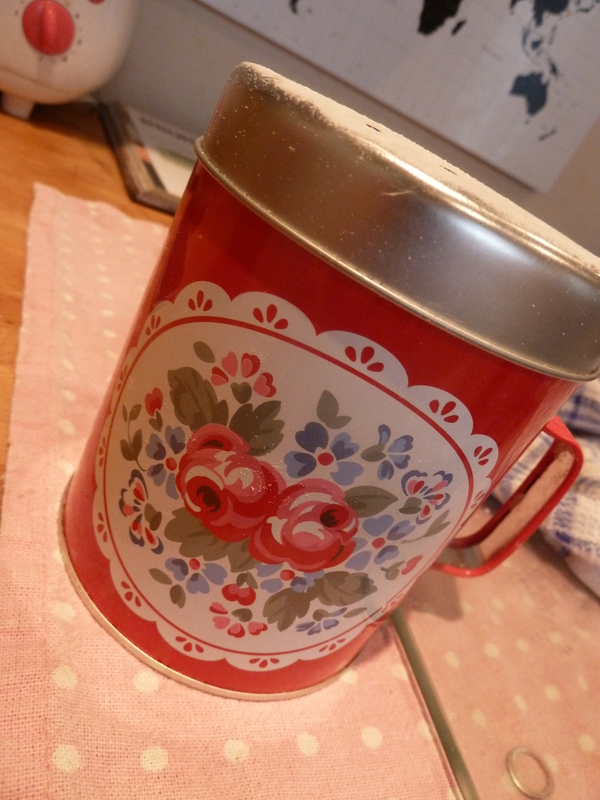 I pressed the biscuity mess into my borrowed loose bottomed tin and shoved it the fridge to set. I threw all the cheese with the melted chocolate into a bowl and whisked it all up then added all the eggs… Using one hand to smash the eggs and one hand to whisk, i ended up with egg shells all over the floor, but an effective method nonetheless. I poured it all into the tin then once again disaster struck. I’m most definitely consistent in one area. My inability to read recipes. Dear Lord, I despair at my own ridiculousness. 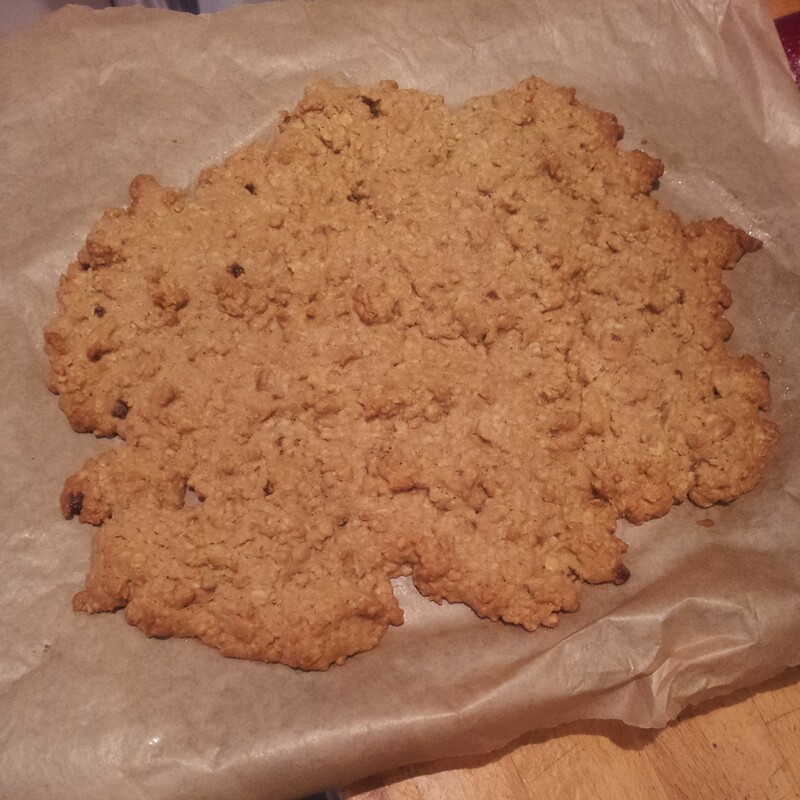 I realised I hadn’t read to the end of the recipe! I didn’t have a tray big enough to submerge the cake in, in order to bake it in a bath of water. 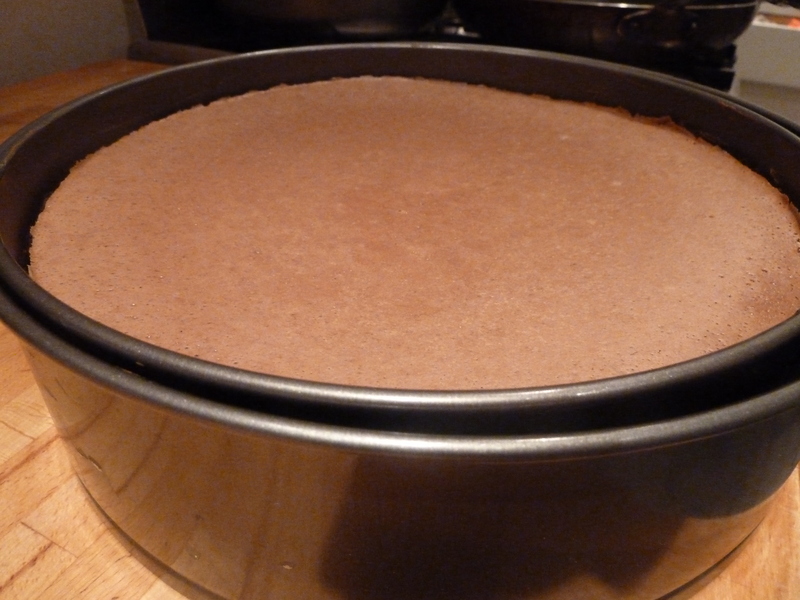 I only had another loose bottomed cake tin which I managed to gently manoeuvre the runny cheesecake into. Upon pouring water into the second tin, I thought I could hear rain. No. 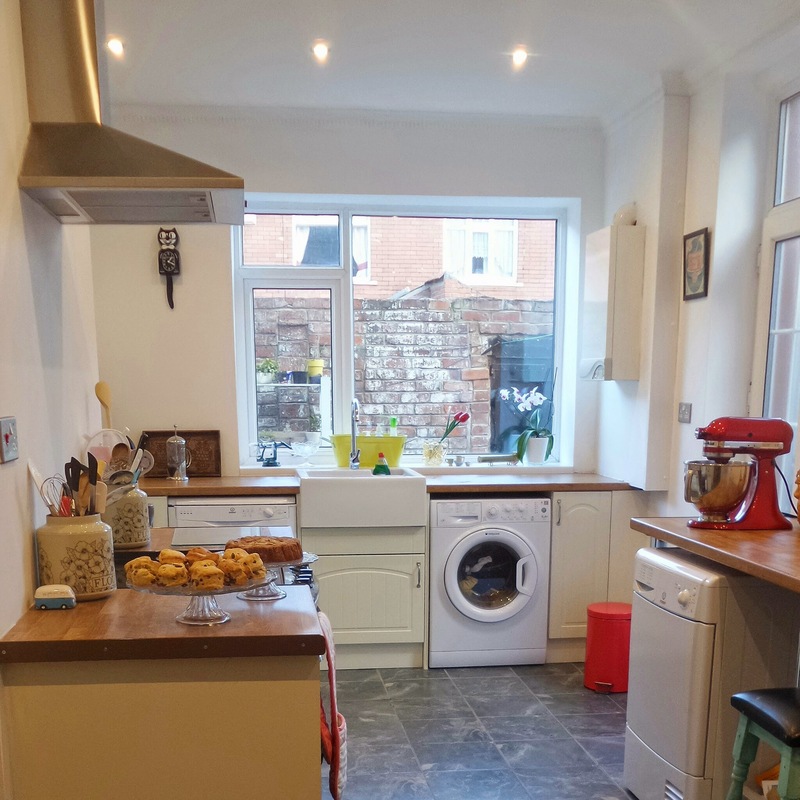 It was all the water running out of my cake tin over the electrical items down the back of the kitchen units and onto the floor. BRILLIANT. I had to abandon the water bath idea and hope that it wouldn’t burn being baking directly in the oven. Just as I was lifting the precariously full tin unto the oven I had a flash of panic. I’ve forgotten something…. SUGAR! (and also vanilla). How did I forget sugar??!! I was so very lucky to have realised at the very last minute, as this would have been a rather expensive and disgusting cheese and chocolate bake. not quite oven ready... quick hand me a ladle!! Quick to rescue yet another failure on my part I grabbed a ladle and scooped the gloopy mixture it of the tin and back into the bowl. 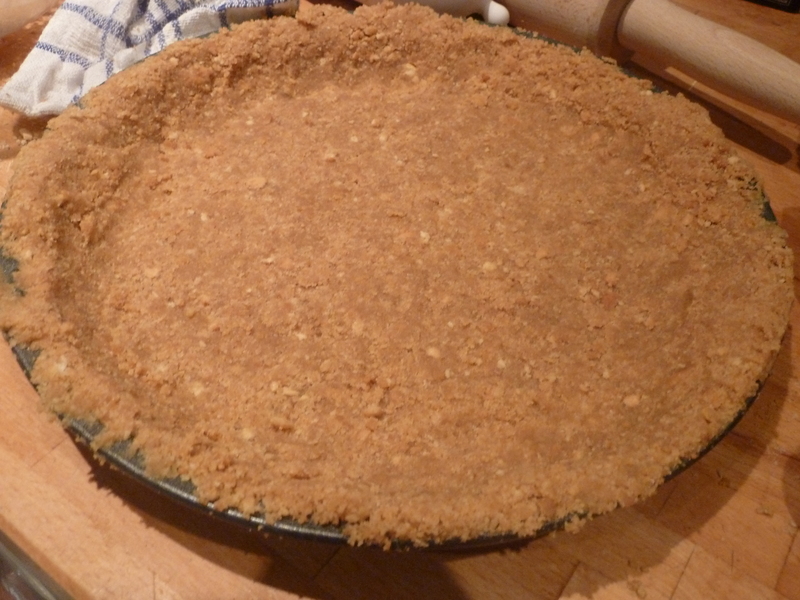 A quick whisk of sugar and vanilla and it was time for the oven again. To compensate for the lack of water I turned the oven down to hopefully prevent burning. 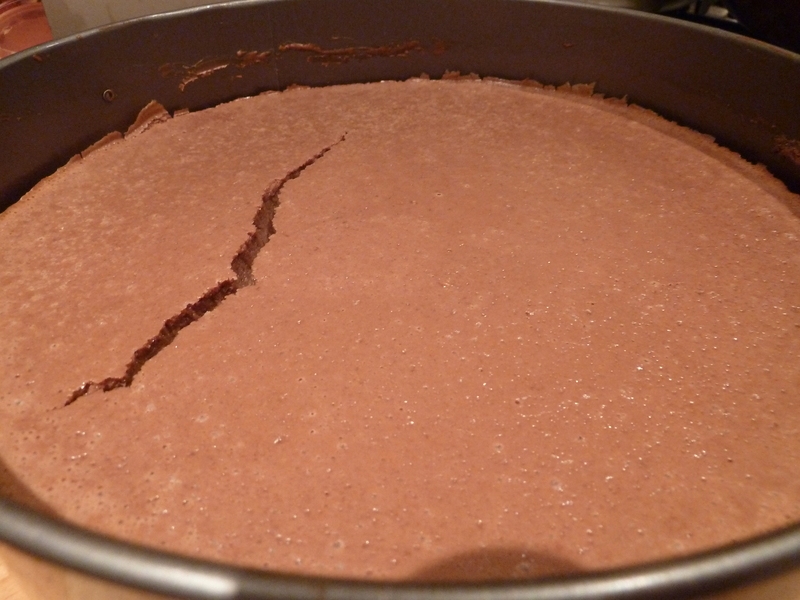 From watching GBBO I know the cheesecake has to wobble a bit in the middle, but mine just kept wobbling all over. I probably kept it in the oven a bit too long. 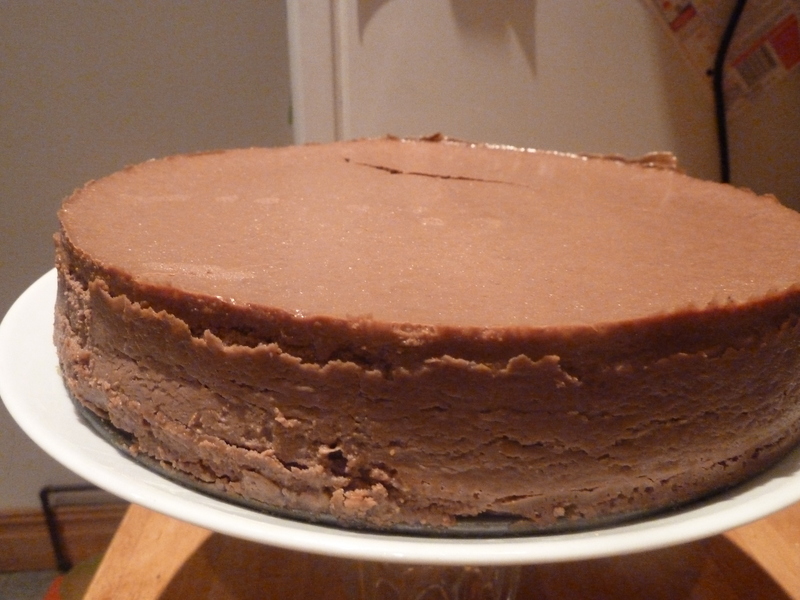 An hour and a half later I had one massive chocolate cheesecake on my hands, albeit with a huge crack down the middle, it looked ok! It needed a night in the fridge and then it was ready for tasting. It’s definitely rich and creamy. It’s so filling you can only eat a little bit in one go, but I quite like it. The Rich Tea base is actually pretty good too! This feeds about 25 people. But from this angle (and if you squint a little) the disaster disappears! Magic! I’ve even purchased some take way pots to deliver take away cheesecake to my friends and family this week. 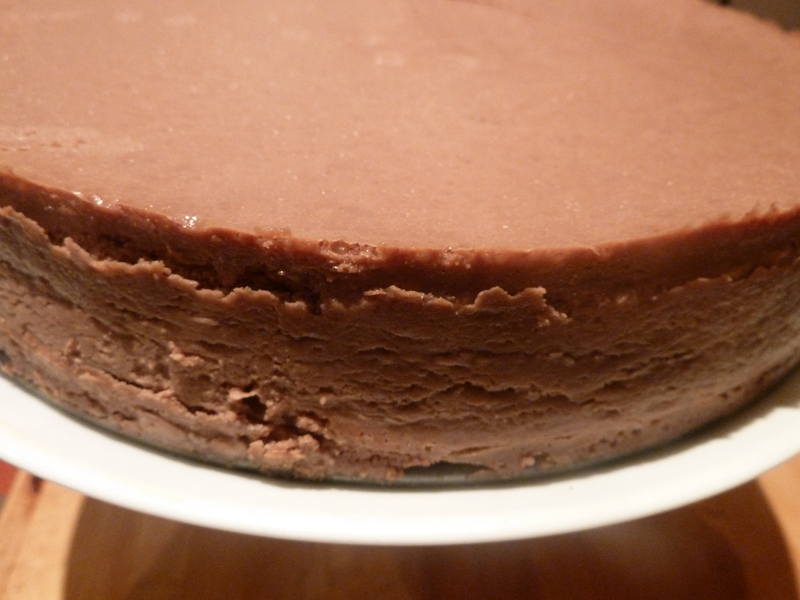 If you’re visiting me this week please beware you will be fed cheesecake and then take some home with you too! Its good to share! I had a vision for what I wanted to bake but didn’t have a recipe to achieve it. I’ve attempted American muffins from The Hummingbird Bakery Cookbook about 5 times now and failed miserably to get them to rise and to look more appetising than a sludgey, sticky, tray bake, rather than lovely risen individual muffins. I give up! 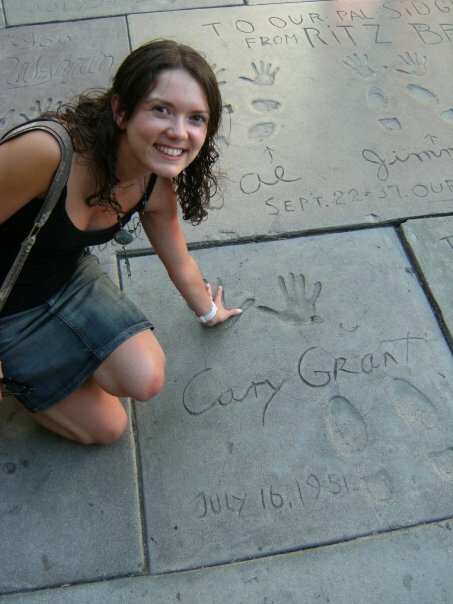 I’ve been to America quite a few times and they do indulgent food so well. 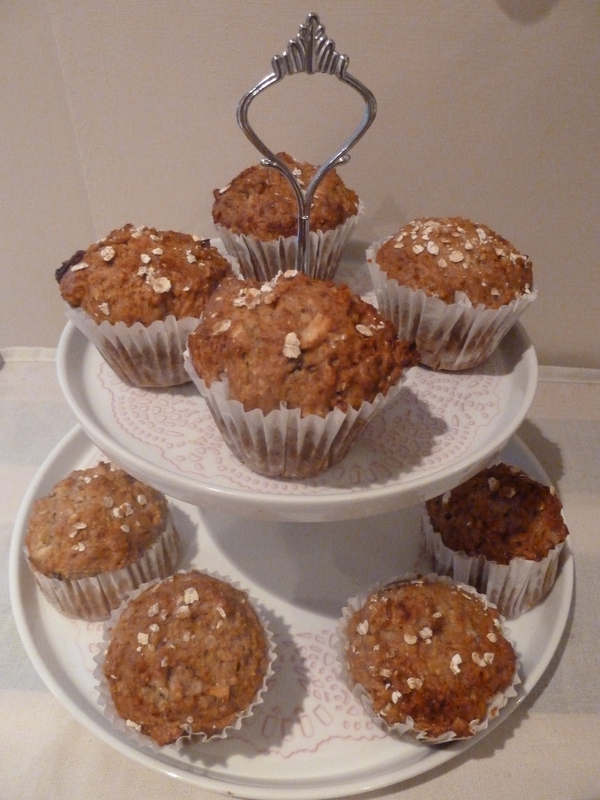 I have quite a few American items on my baking wish list so where better a place to start than the good old fruit muffin. 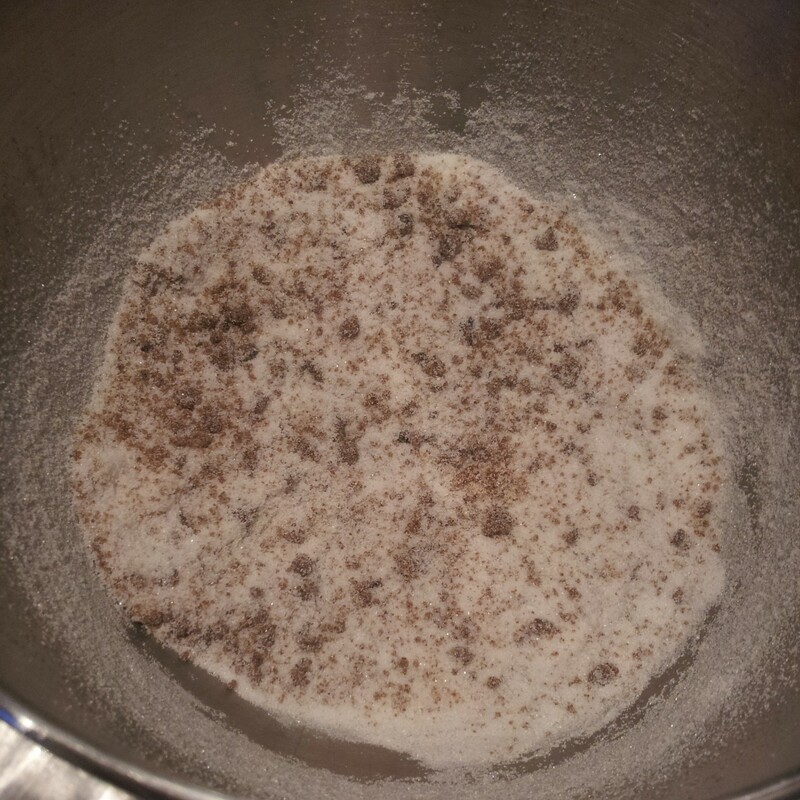 2 cups (3/4 cup (150 grams) combination of half brown and half granulated white sugar. 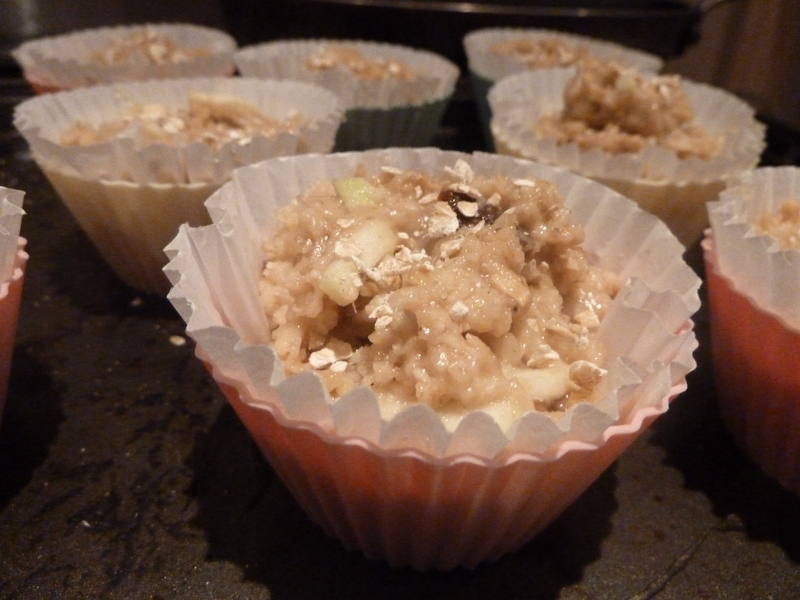 Chopping the apples up in a hurry before yoga, I left them along with the oats to marinade in the fruity, sugary, cinammony mess that I had made. 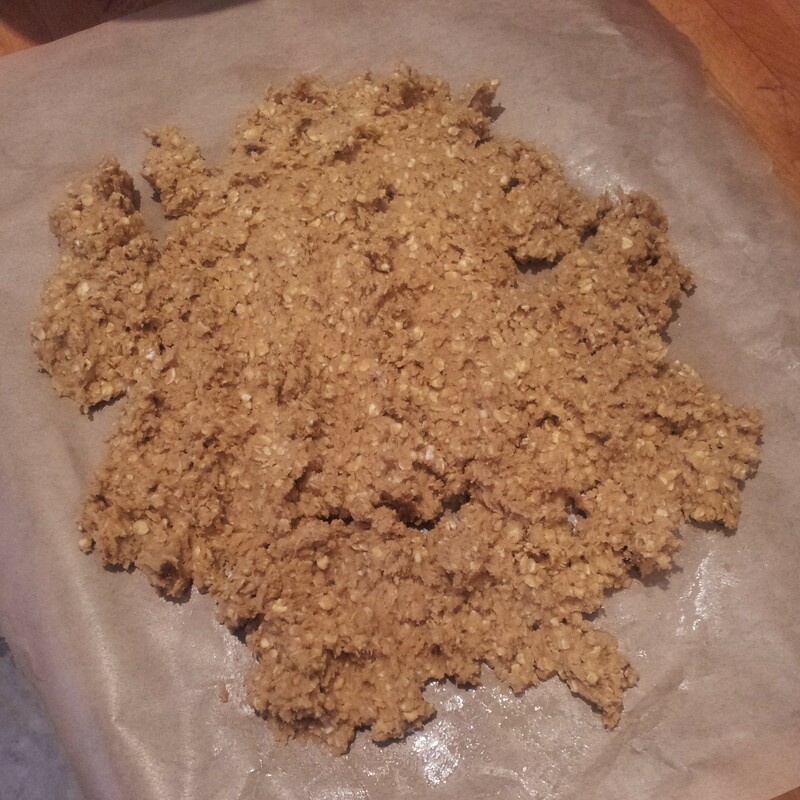 All that was left to do was to throw the rest of the dry ingredients in and gently mix it all together.. Accidents happen. Somehow, despite bringing my massive laptop into the kitchen and balancing it precariously on the hob, to avoid touch screen phone issues, I still misread the basic recipe!! Mixing up the measurements for the flour and sugar. 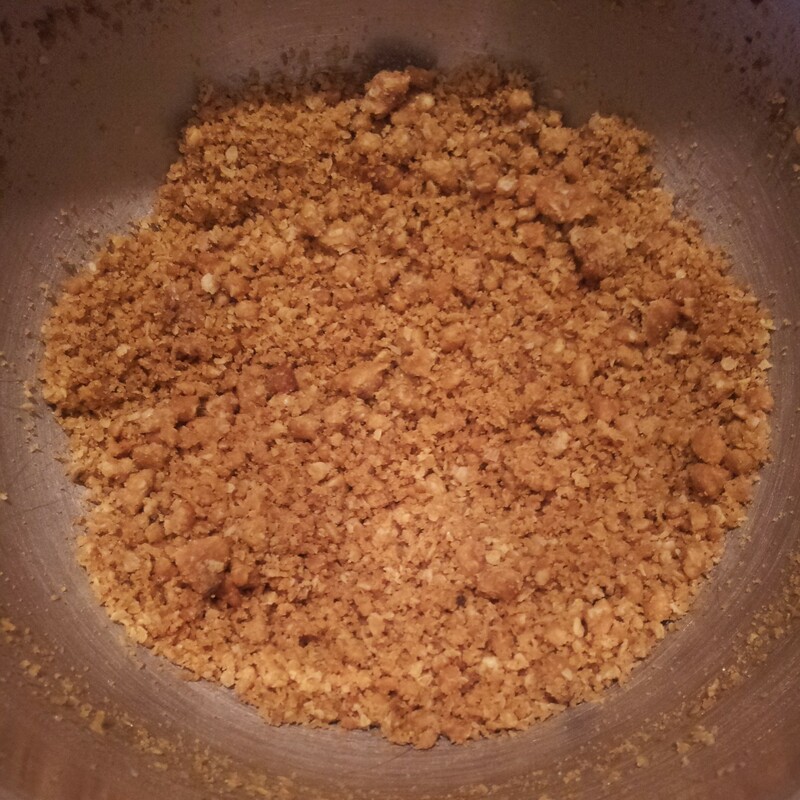 I realised a little too late that I had added 3 times the amount of sugar (and extra honey that I had taken the initiative to chuck in too) that the recipe needed. Yikes, these were going to be ridiculously sweet muffins! 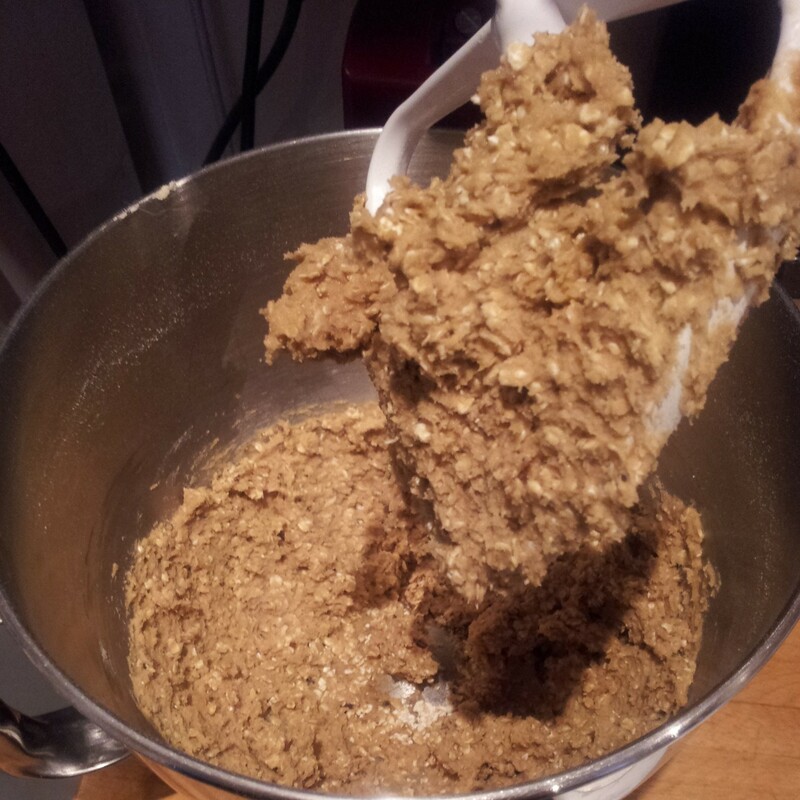 To balance this out I added more flour and oats. Creating more problems for myself, as per usual. Now I know that oats soak up all the available moisture, wherever they are. If only hadn’t poured away all the sugary apple juice that had seeped out from the fruit. But hey, you bake, you learn. 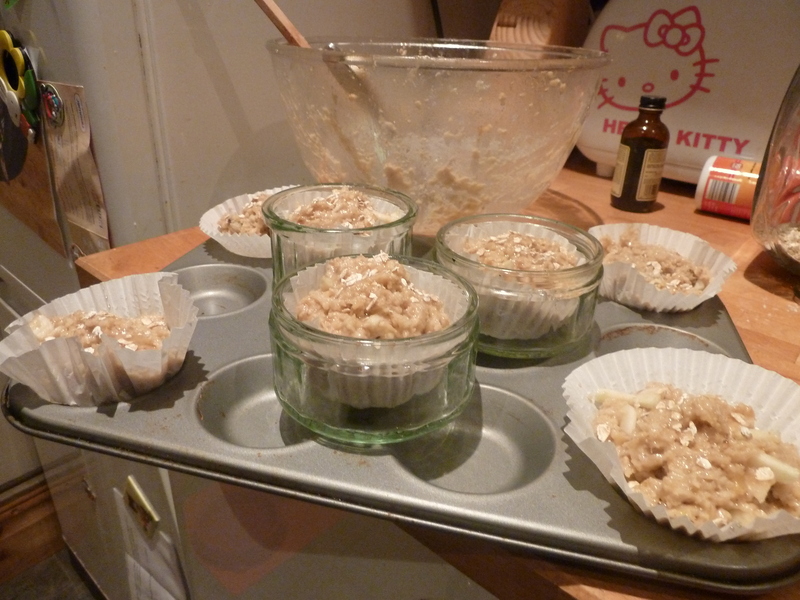 I keep considering investing in a proper muffin or cupcake baking tray but have yet to commit to it. 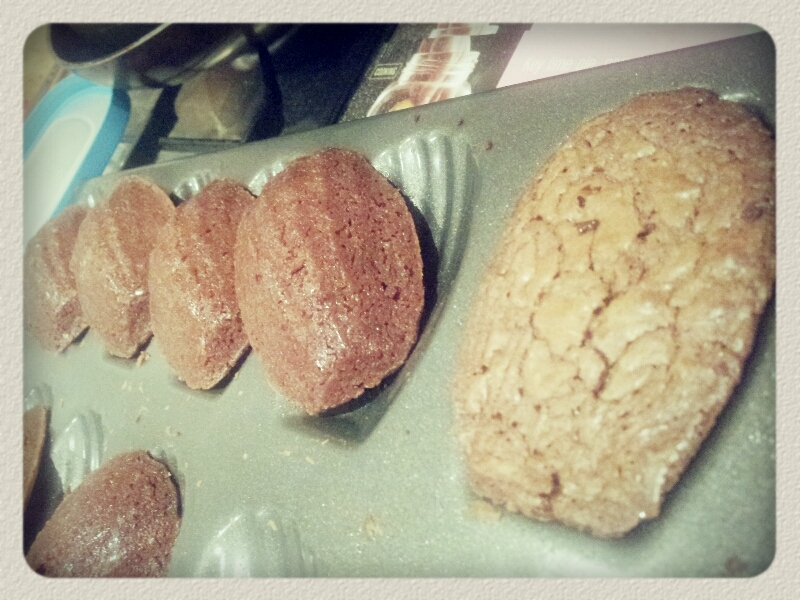 Undiscouraged by my lack of baking equipment yet again. (I see it as an opportunity to make life interesting…) I improvised. 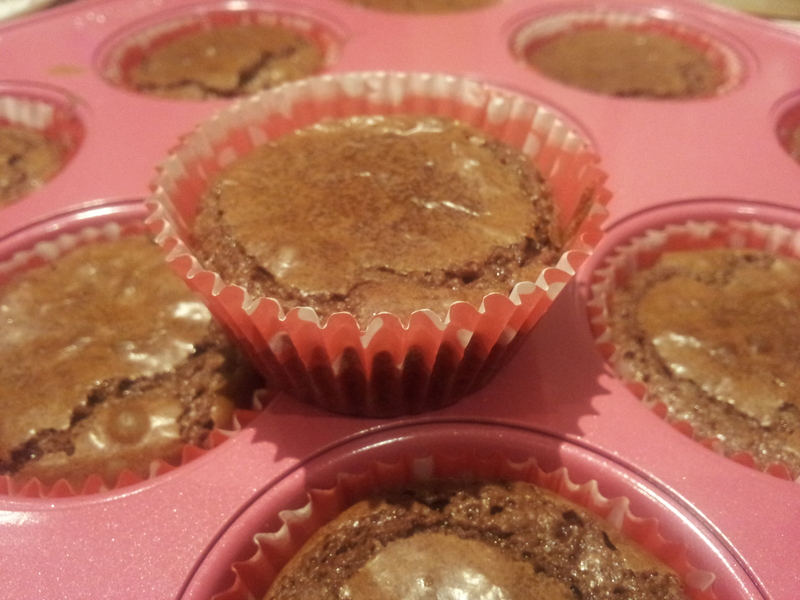 Using a set of silicon cupcake cases set on a flat baking tray. 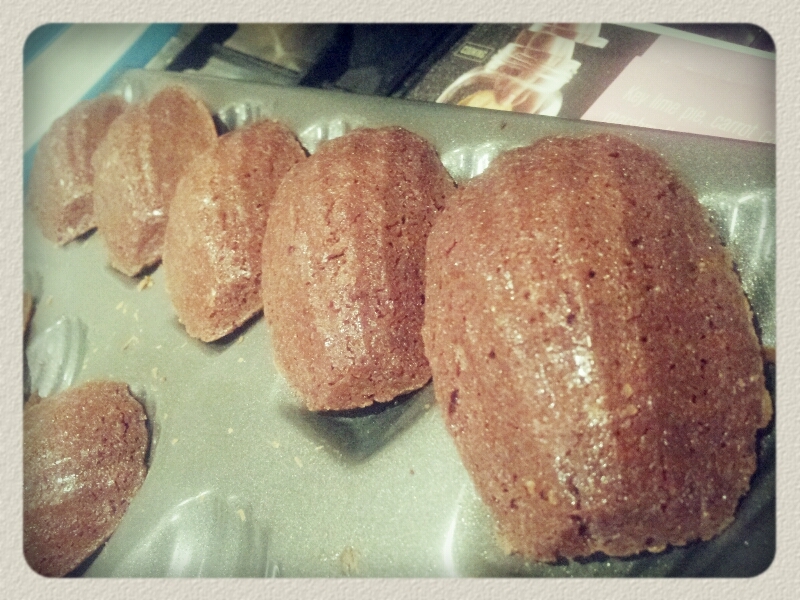 I filled paper muffin cases with the mixture and squashed them in to the silicon cases. I figured they would hold the muffins in the right place. You may wonder why I didn’t just cook the muffins in the silicon cases. 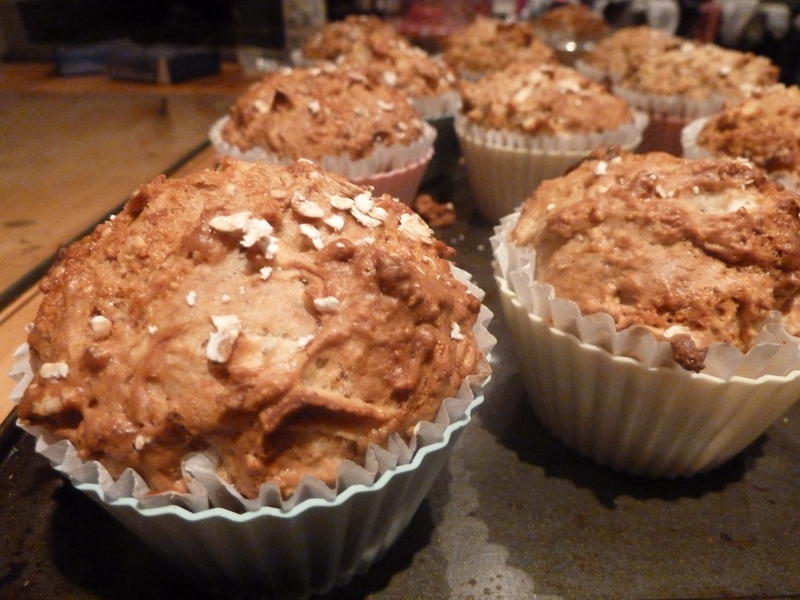 I’ve had some unfortunate silicon cooking experiences; uncooked bottoms, half the cupcake stuck in the case etc. so prefer to use paper cases these days. 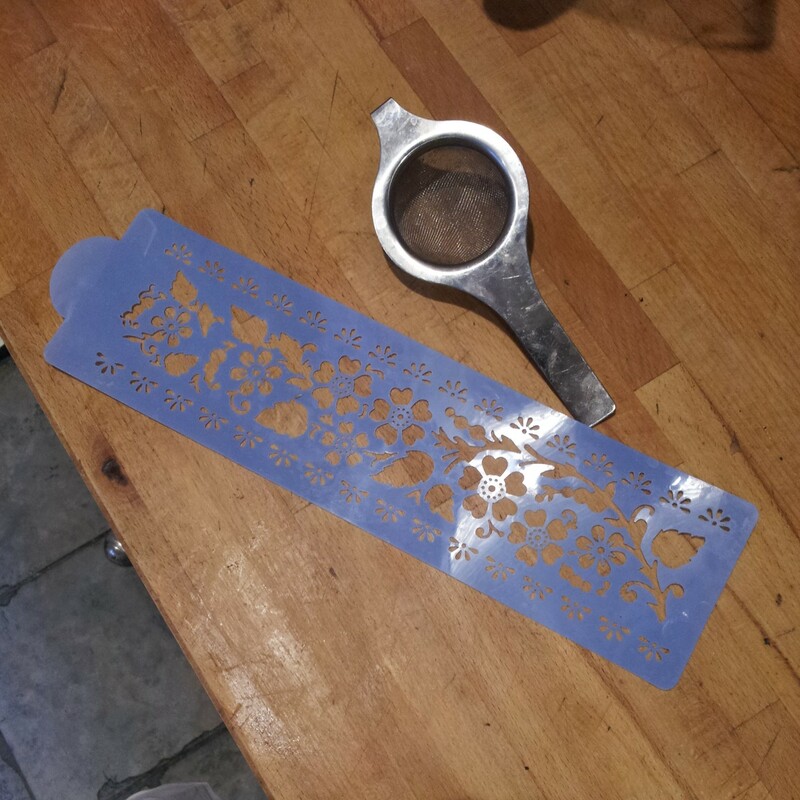 Once I ran out of silicon cases I rummaged round for something else ovenproof to hold the paper cases upright (and avoid muffin sludgage) and landed upon some ramekins. Perfect. 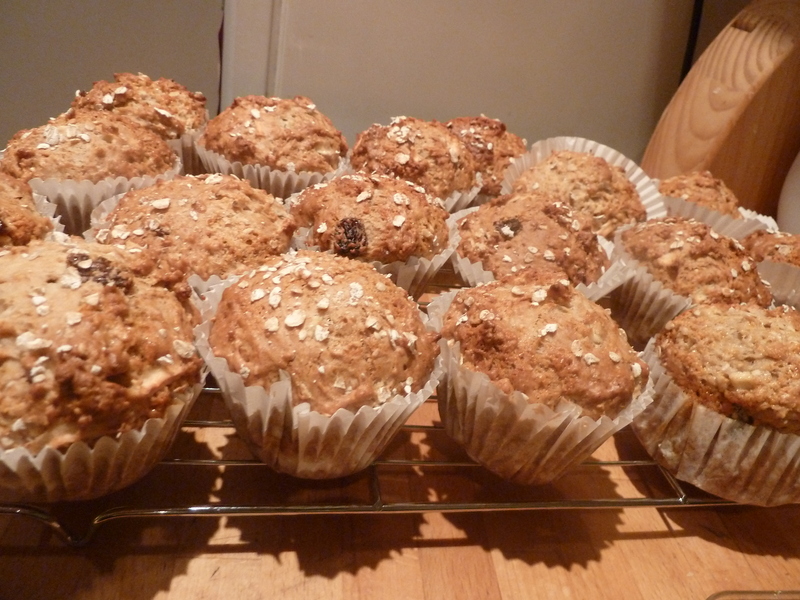 Before I popped them in the oven a sprinkled on a few more oats on each muffin and drizzled on some honey to make them look all rustic and pretty. They smelled amazing and tasted really good too. They were fully cooked and had a proper shape too! Amazing! Maybe paper cases in ramekins and silicon cases are the way forward? No more rivers of muffins for me! The only improvements that could be made would be to add an extra banana and leave in all the fruit juices. Maybe even a slightly bigger dollop of honey on the top too would add a bit more moisture. They were definitely sweet enough though! For my first attempt at full on recipe creation it wasn’t too bad, especially with a good cup of tea. Now to share them with everyone at work, as I can’t possibly eat all of these myself!